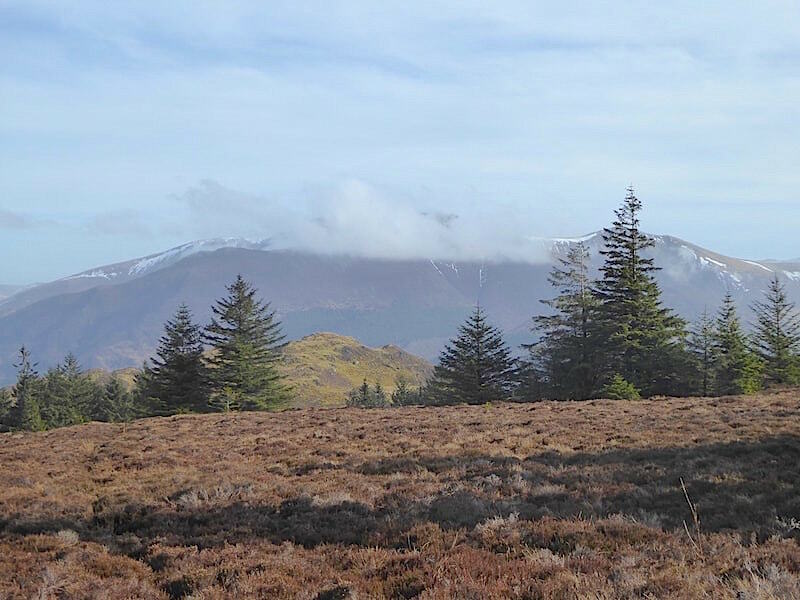 A dry day with little wind was forecast for today and, with all the wild weather of the past two weeks keeping us indoors, we were keen to get out walking again. 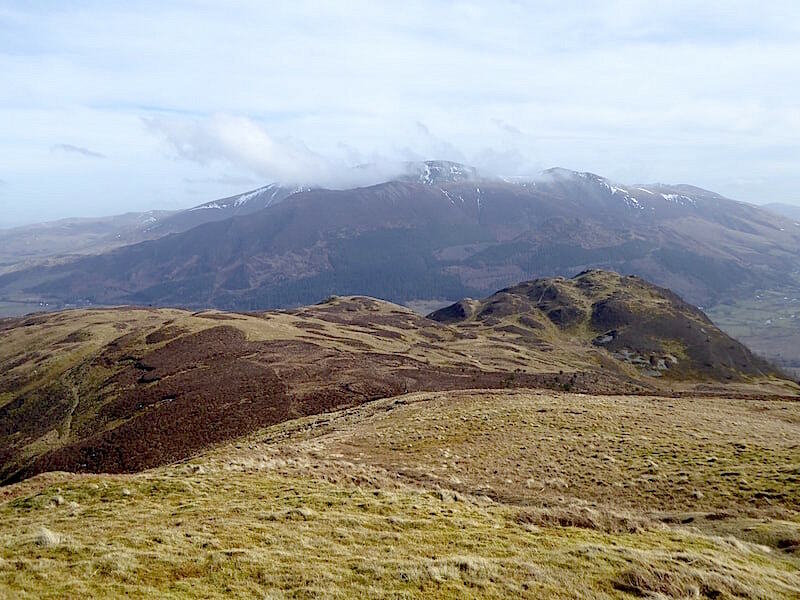 Most of the country seems to be back to normal but around here the snow has only been very gradually melting away at valley level and there were further falls on the high fells at the beginning of this week. All the roads have cleared but a couple of trips around the eastern Eden valley during the past week revealed some very large drifts still lying along the verges of the back roads. One road had drifts on both sides much, much higher than our vehicle, which must have blocked the road completely during the worst of the weather. We were able to pass through but it was like driving through a twelve feet high snow alley. This past week has been cold, windy, grey and gloomy with very low cloud obscuring all but the lowest of hills so there was little point in heading out anywhere. Friday was a beautifully calm and sunny day but we couldn’t take advantage of it because we were doing something else. The north Pennines were visible for the first time in two weeks and, covered by fresh falls of snow, looked simply stunning. Yesterday it rained all day so that was a non-starter, and there was also an item in the diary for today but getting out for some exercise and fresh air was a more attractive proposition so that fell by the wayside. 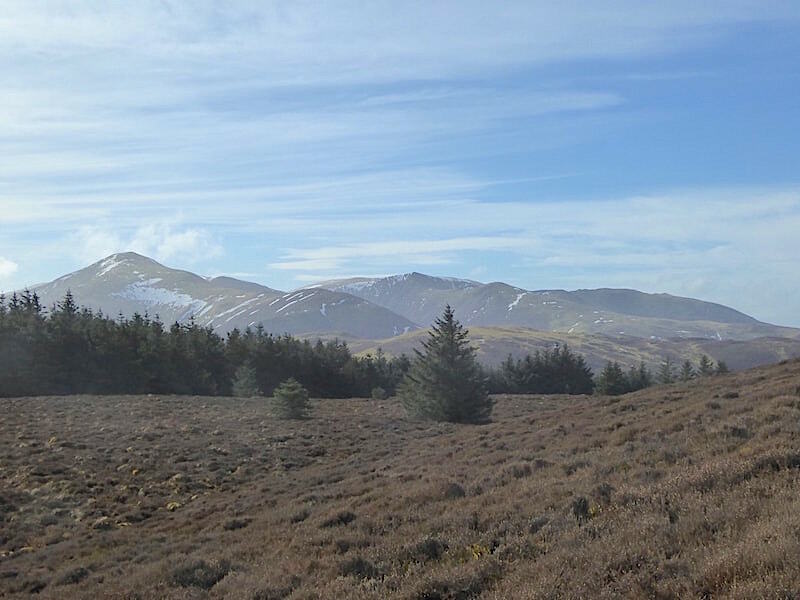 After two weeks of seeing nothing much other than snow it was becoming tedious so we looked for a walk with some height but not high enough to still have a covering of snow, you can have too much of a good thing after all, hence our choice of the fells around Whinlatter. 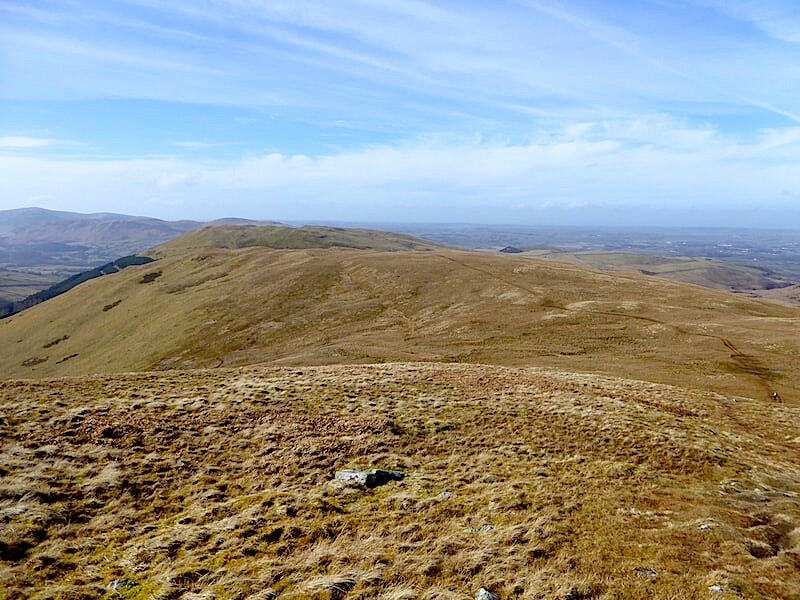 As things turned out, over in the west of Cumbria very little snow remained, even on the higher fells, and we had a really enjoyable walk in perfect weather. 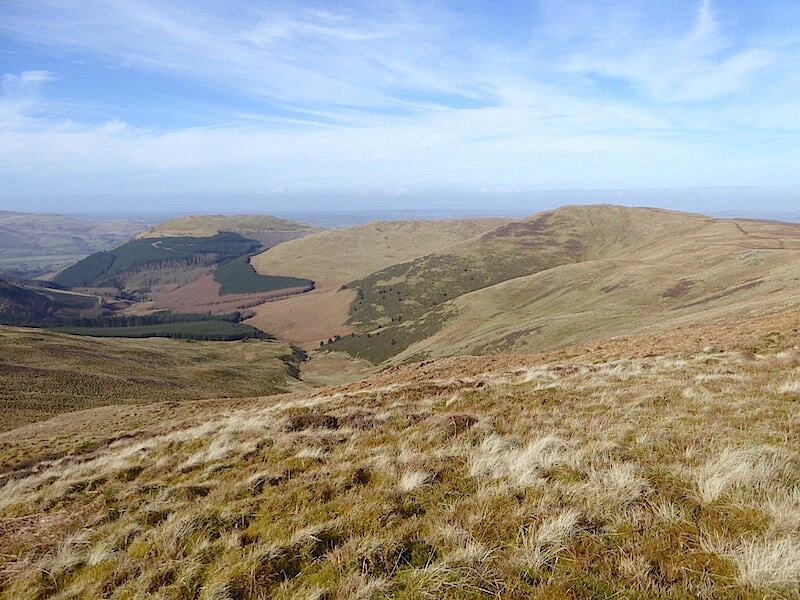 It was good to be out on the fells again. 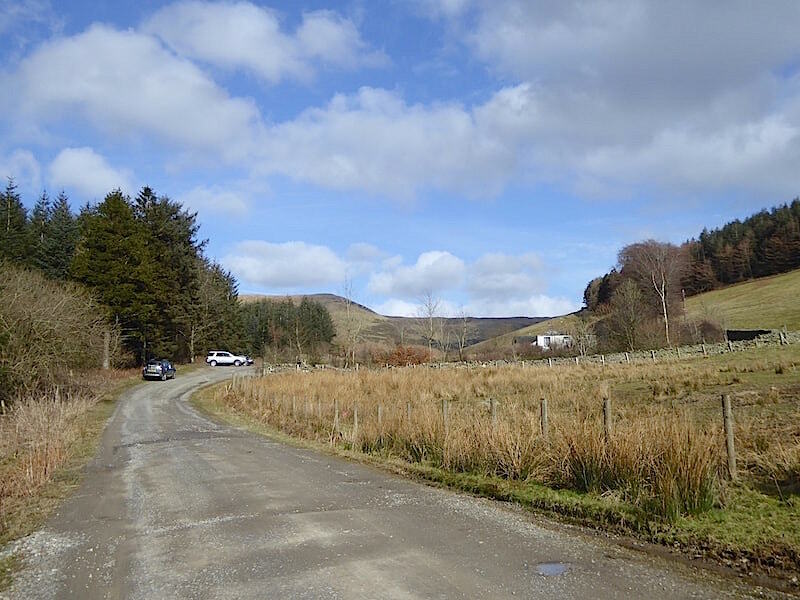 We parked up a little further up the road from the usual parking area and a couple or three cars were already parked when we arrived, their occupants already away to the hills. As we were kitting up another car arrived, the driver of which came over to us and asked if we were part of a walking group which he was intending to meet up with. He wasn’t absolutely certain that he was in the right place either but as we weren’t planning on joining the walking group we couldn’t really help all that much. He mentioned that he was a little early so he returned to his car having decided to wait a while and see if anyone turned up. 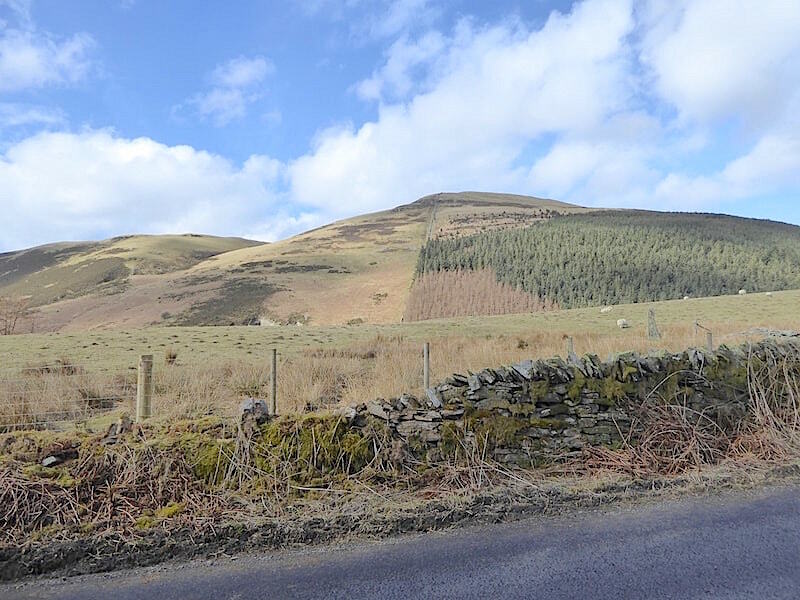 The photo above is looking back down the road with a view of Ladyside Pike and Swinside on the skyline. Looking the other way towards the locked barrier with Darling How Farm over on the right. Its a warm and beautiful morning with hardly any breeze and my jacket gets stowed away in my pack right from the off. 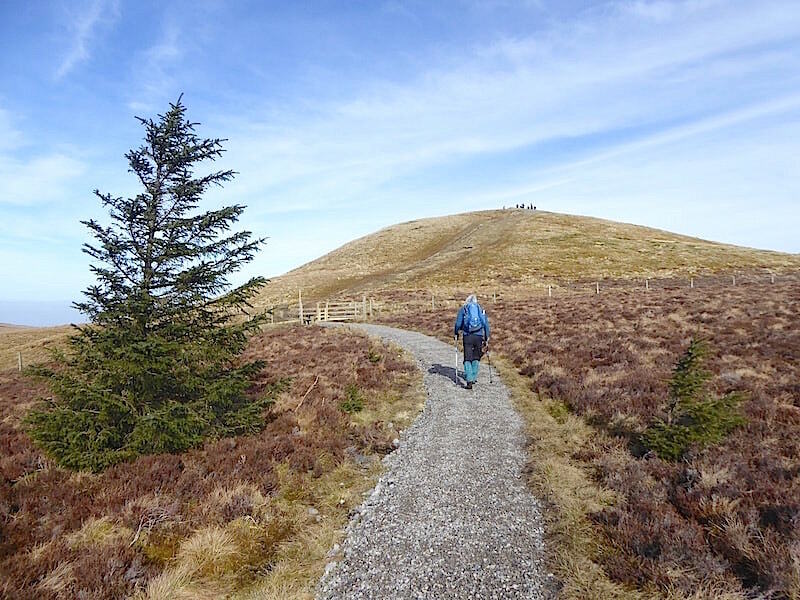 We last did this walk on 14 March 2016, almost two years to the day and, amazingly enough, in almost identical weather. One of life’s little coincidences I suppose. 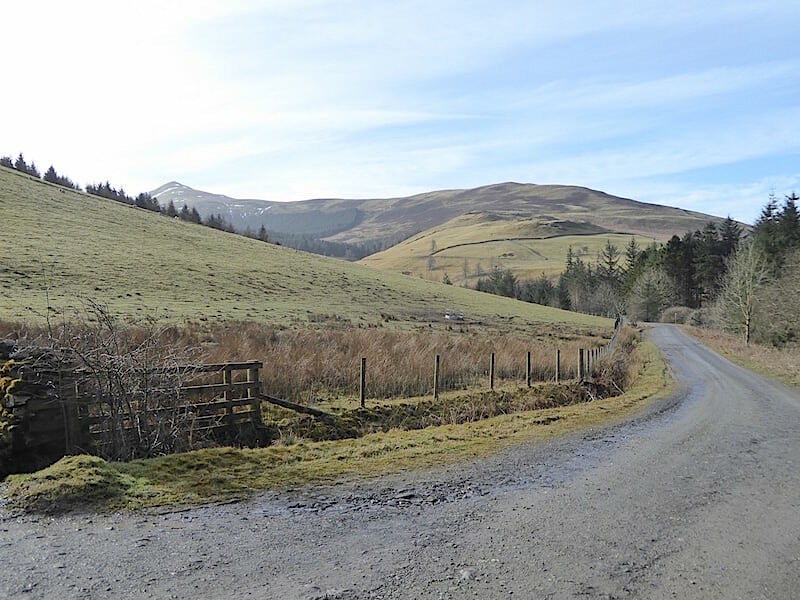 Off we go then, on the long and winding forest road, walking the 2.6 miles to our first fell, Lord’s Seat, which isn’t in the shot and will only come into view as we round the bend further along the road. 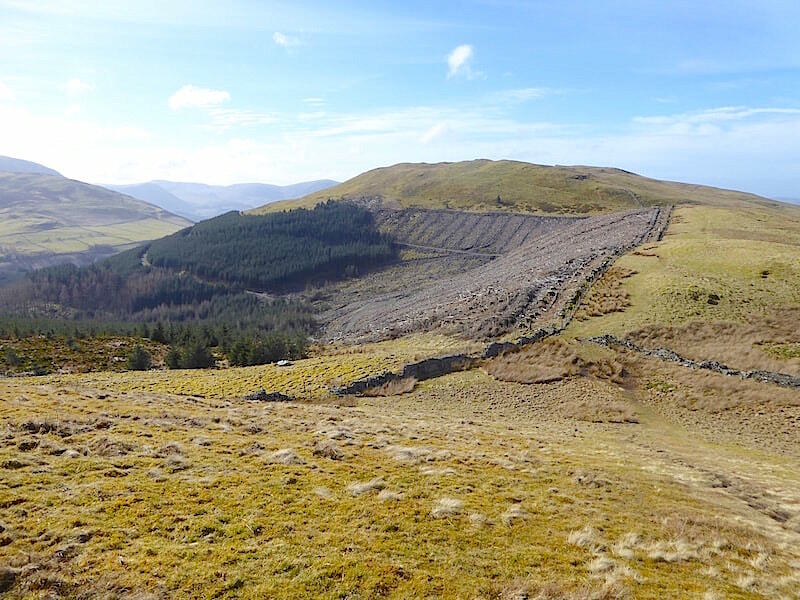 Our second fell of the day, Broom Fell, is on view though just to the right of centre on the skyline. Not very far along the road from the locked barrier is this side road on the left which leads down to Aiken Beck and on up to Graystones via a series of forest roads. 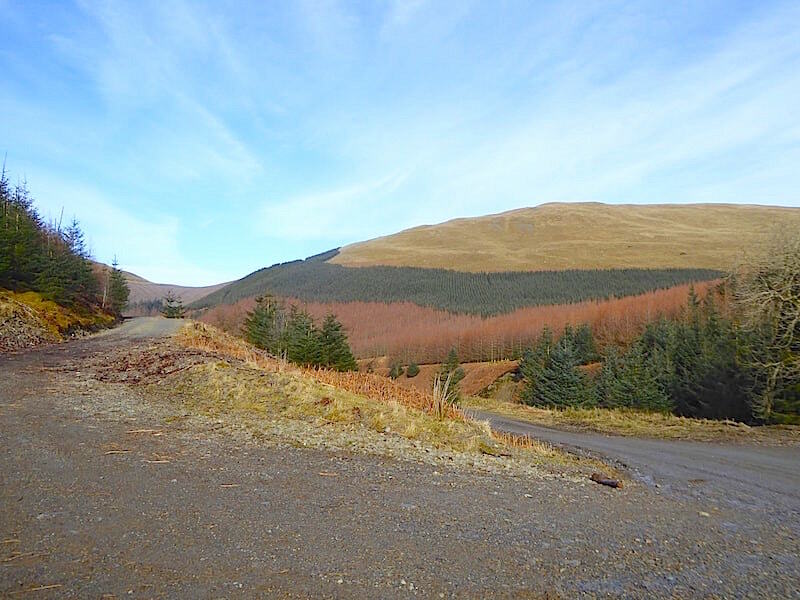 This route doesn’t lead to the summit of Graystones though, the forest road ends at a wire fence, beside the broken wall, where it meets up with the existing Graystones path just above the tree plantation. 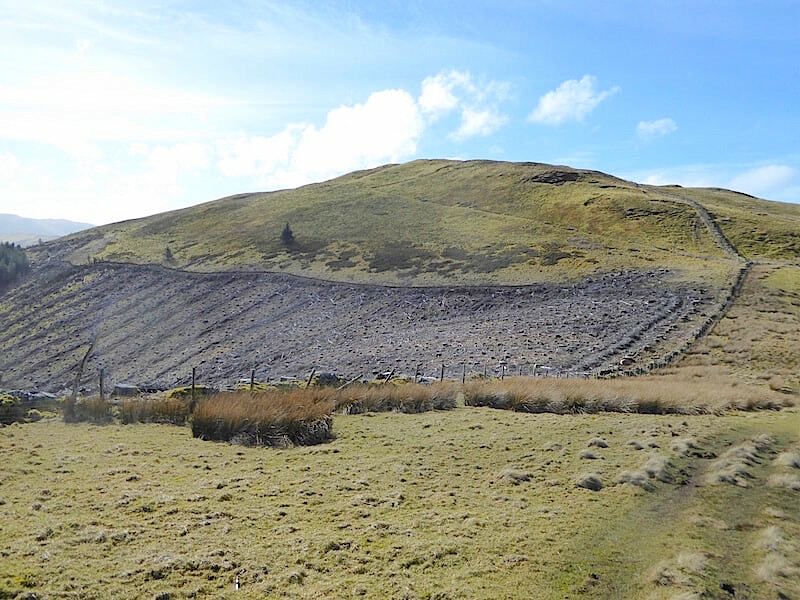 From that point there is still quite a bit of steep climbing to be done before the summit of Graystones can be achieved. A look back at Graystones as we tramp along the forest road. 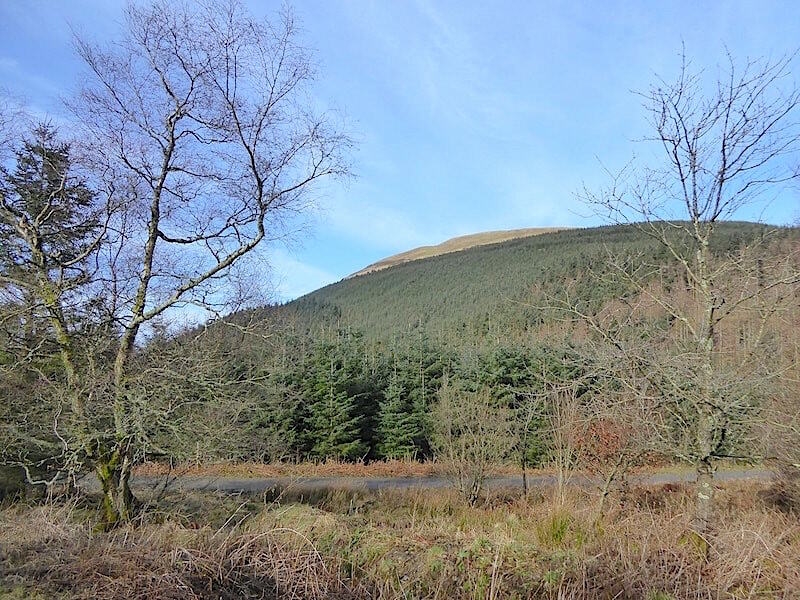 Lord’s Seat on the centre skyline as we reach the bend in the forest road. 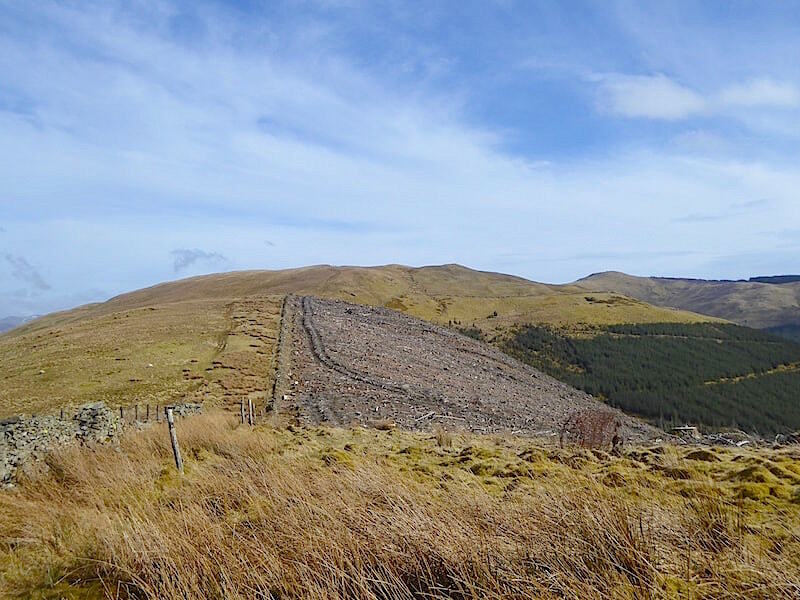 At this point the lone larch tree marks the point at which a path, off to the left, descends to Aiken Beck and eventually leads up the south ridge of Broom Fell alongside the broken wall. 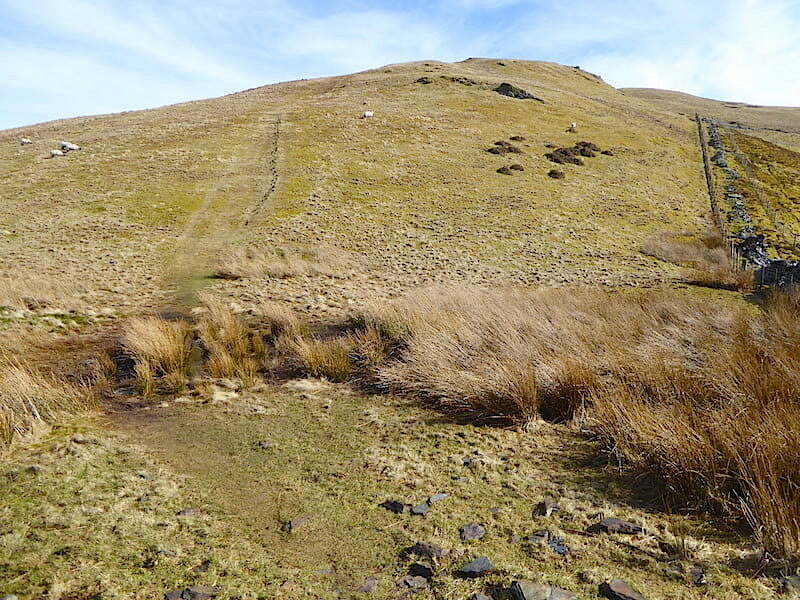 Another very steep climb and one which AW described as ‘tedious’. As we weren’t in the mood for ‘tedious’ we carried straight on. 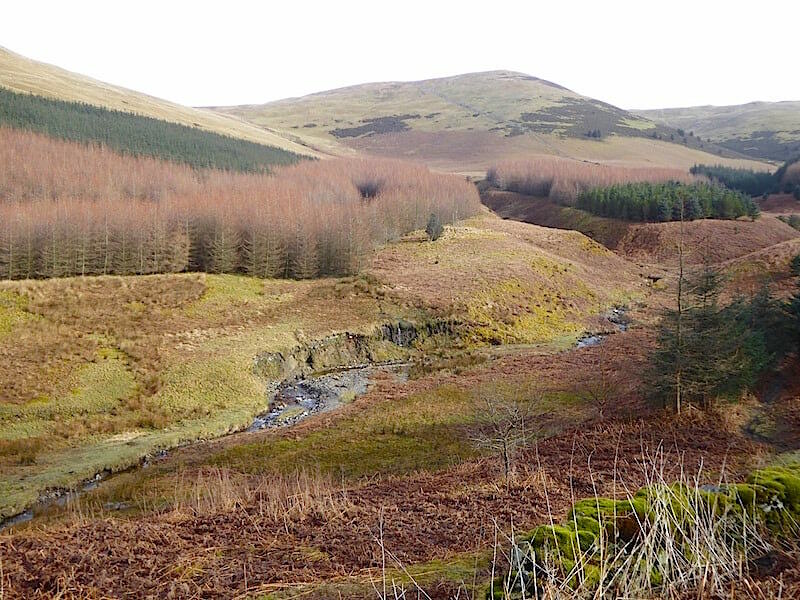 Aiken Beck Valley and Broom Fell from the lone larch tree. After about a mile yet another forest road turns off to the left, we ignore this one too since it leads to nowhere in particular. The marker post indicates the road on the right is the one to follow. It looks quite flat but looks are deceiving and it climbs steadily, with a corresponding increase in the breathing rate as we chug along it. 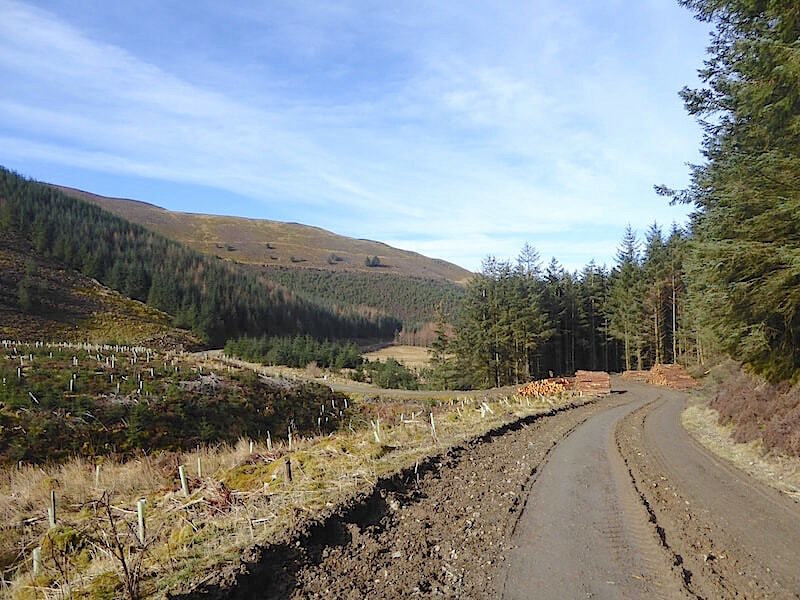 A look back at Graystones from the same spot with yet another forest road heading back across the lower slopes of Whinlatter Fell. 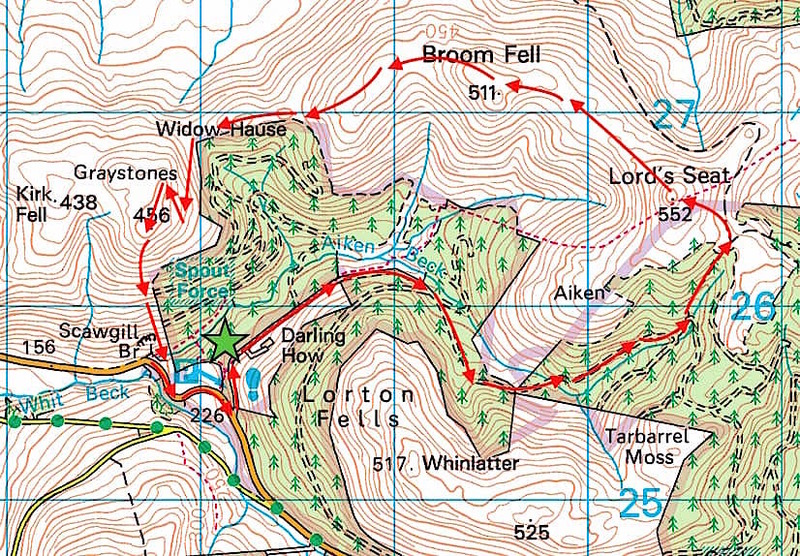 Looking back at Graystones and Broom Fell as we carry on from the waymarked junction. 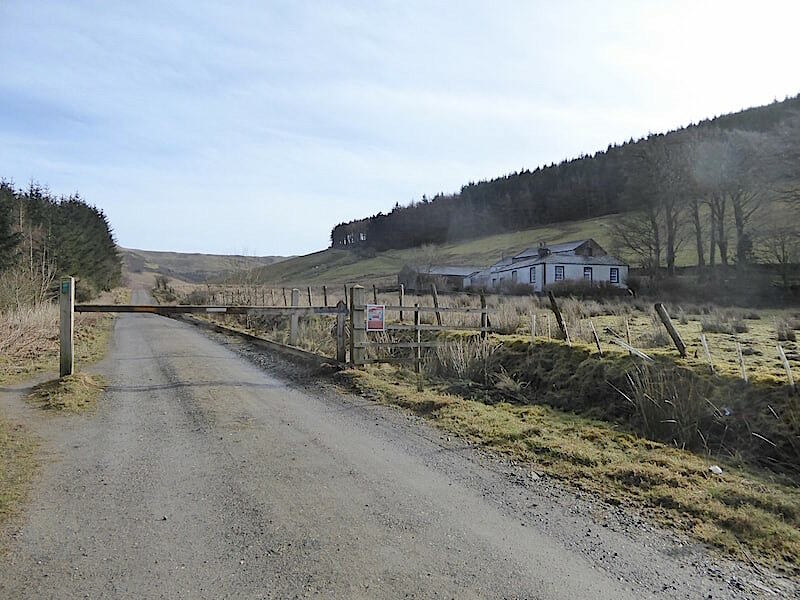 The road eventually drops down to the bridge over Aiken Beck and where the notices attached to the fence warn us of dire consequences should we be foolhardy enough to continue. Naturally, having read them we ignore the signs and carry on. 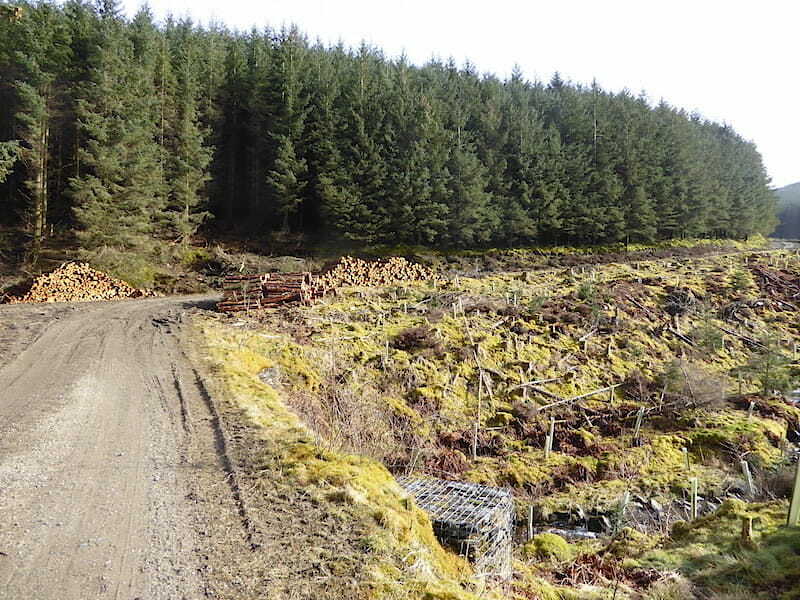 Its Sunday and there is neither sight nor sound of any logging activity anywhere, and its so quiet the only sound is our boots crunching over the gravel track, no birdsong, nothing, just silence. Crossing the bridge over Aiken Beck where the smell of freshly cut wood creeps into our nostrils, and the dry stony track turns into …..
….. a continuous series of slimy, gloopy and deeply muddied ruts and grooves …..
….. with stacks and stacks of logs piled next to it …..
….. all the way along. 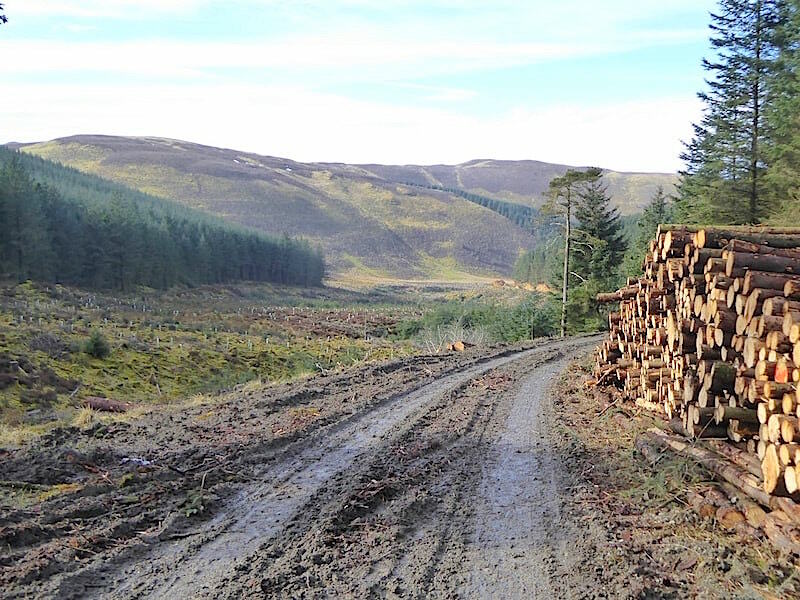 By way of compensation the smell of the sawn wood was very agreeable and there was a good view back to Whinlatter Fell. 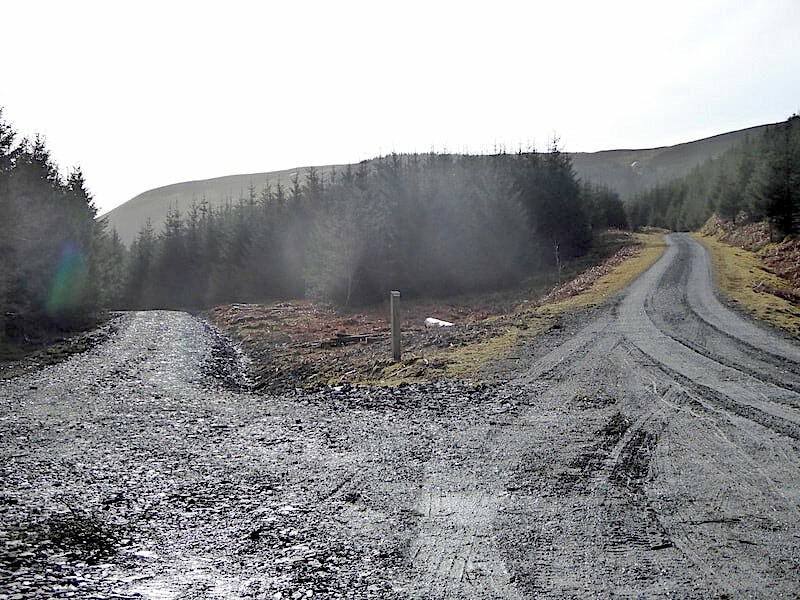 This junction was eagerly anticipated, not only does it mean we are getting closer to Lord’s Seat but also that we can finally get off this hideously messy road. I made a special effort to walk up to the waymark post to read the notice only to find that there was nothing there. Not that it required much of a special effort since we had to turn left here anyway, I just thought I’d be a bit of a ‘drama queen’ for a moment or two. 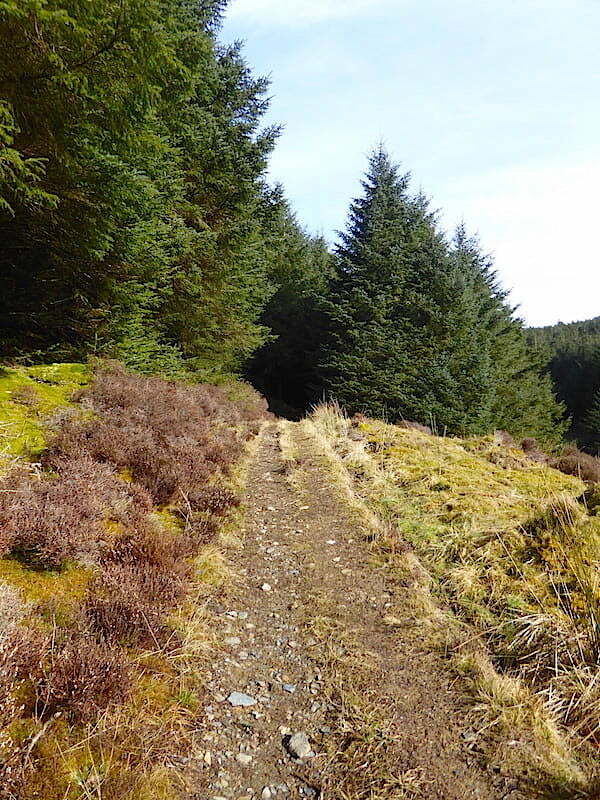 So we left the forest road and onto this path which climbs through a break in the trees …..
….. and which offers a pleasant walk through, what I call, the ‘tree tunnel’. 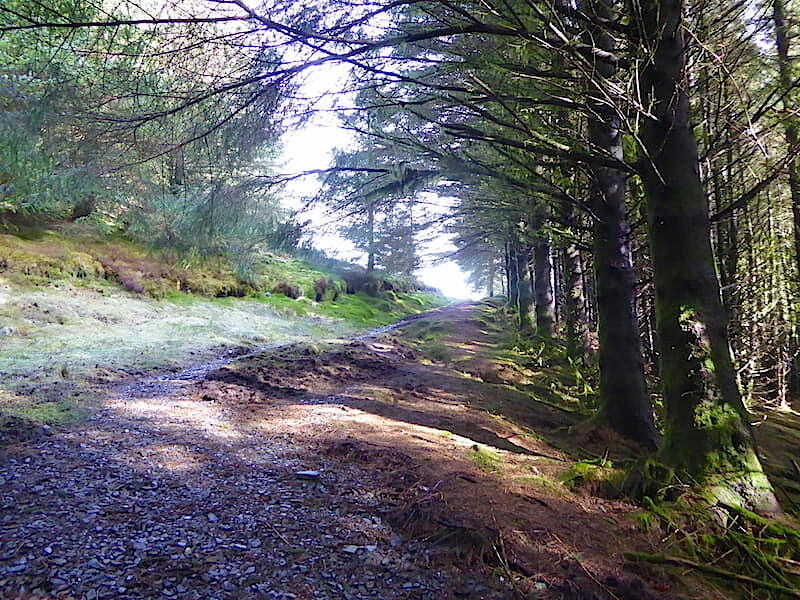 We had expected the path to be very muddy after all the snow and rain but it was surprisingly dry and a delight to walk on. From one of the more open patches along the path here’s a look back through the ‘tree tunnel’. 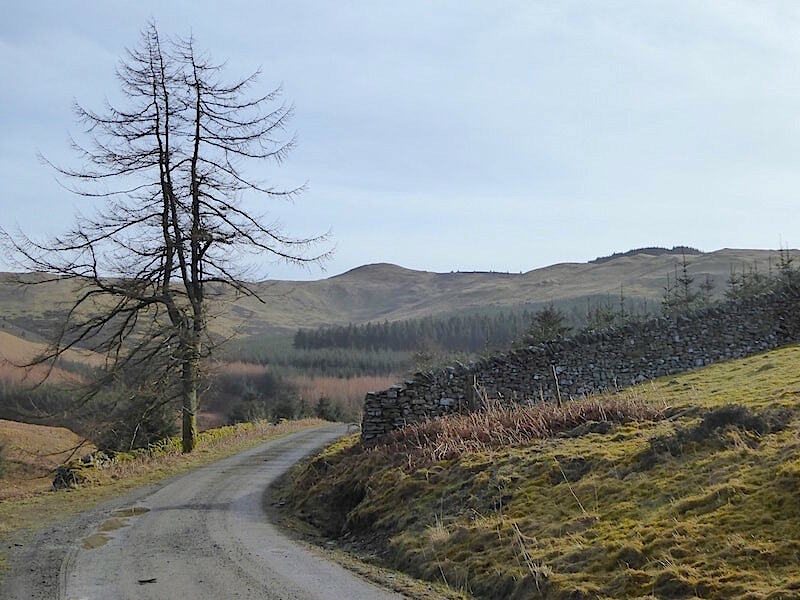 That little tree has certainly put on a good amount of growth over the past two years, as a look back at a similar shot taken on our March 2016 walk will illustrate. 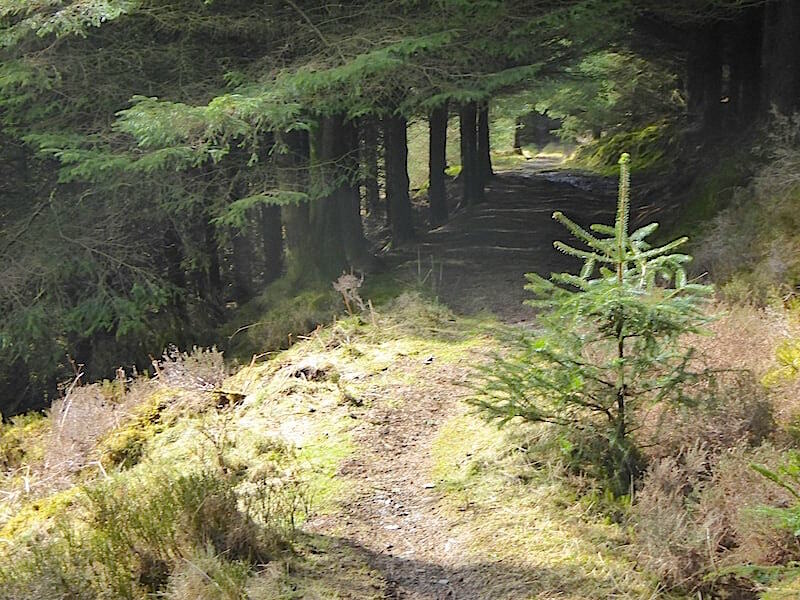 The climb through the trees is coming to an end and will bring us out onto the little ridge between Lord’s Seat and Ullister Hill. 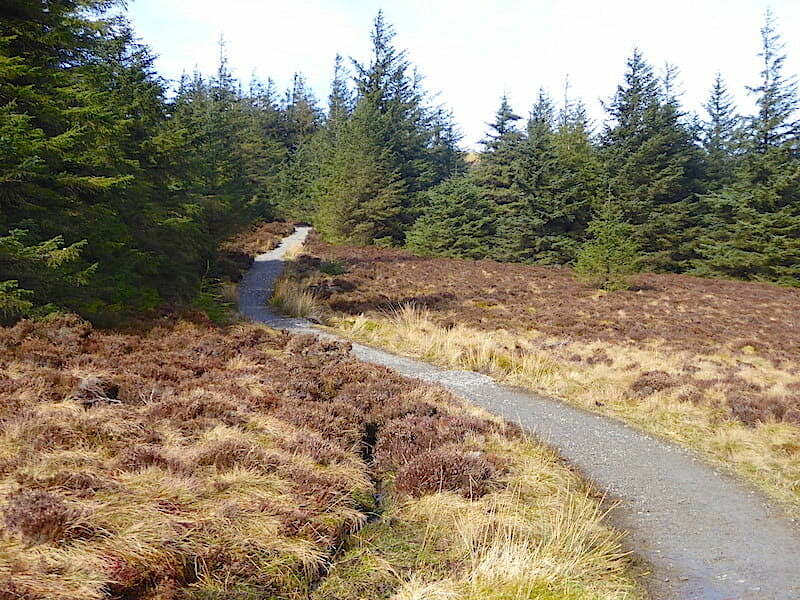 Before reaching the ridge there is a short boggy section at the top of this path which can be largely avoided by keeping to the slightly higher and drier ground to the left. 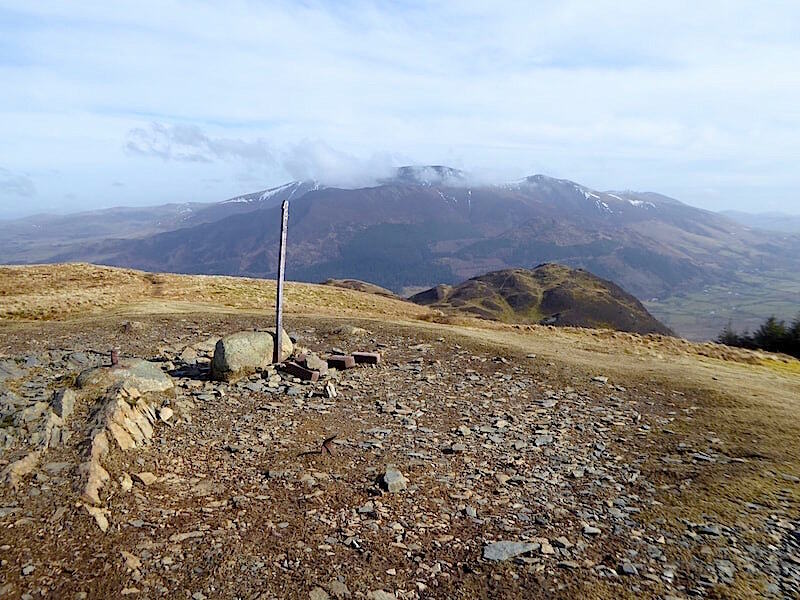 Having negotiated the soggy morass we emerge onto …..
….. the ridge path, where we take a left turn, and from where …..
….. we get a cloudy view of Skiddaw and its few remaining patches of snow, while over to the right …..
….. is a skyline panorama of Grisedale Pike, Hopegill Head and Whiteside. As we approach the stile and the path up to Lord’s Seat we saw the crowd up on the summit so, after crossing the stile, we veered over to the left to a low outcrop, and took a coffee break to give the group time to look around, take their photos and depart without us getting in anyone’s way. The coffee stop view along the Aiken Beck Valley with Broom Fell over on the right and the tree covered slopes of Graystones over on the left …..
….. with another view of Grisedale Pike and its neighbours hogging the skyline, while Whinlatter Fell has to make do with just managing to put in appearance below them across the centre of the shot. 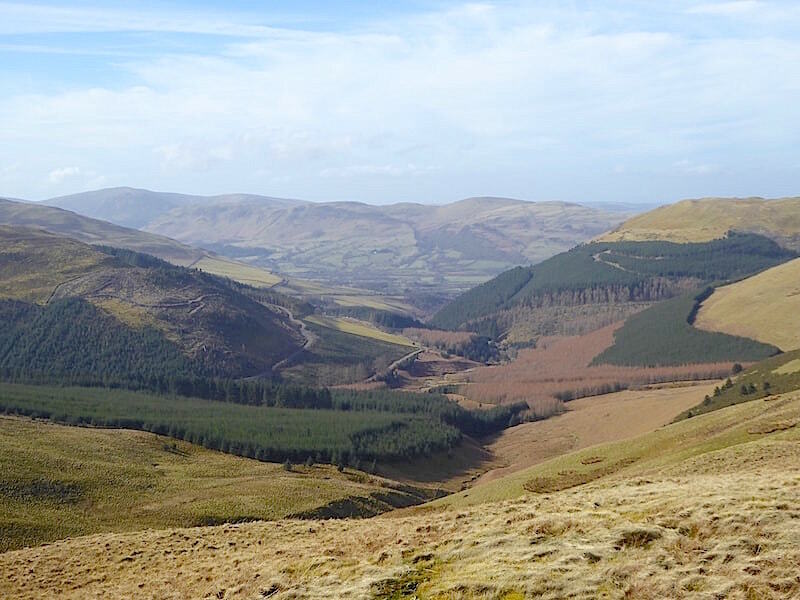 Another look along the Aiken Beck Valley with the merest glimpse of Lorton Vale appearing in the centre between Whinlatter Fell and Graystones. 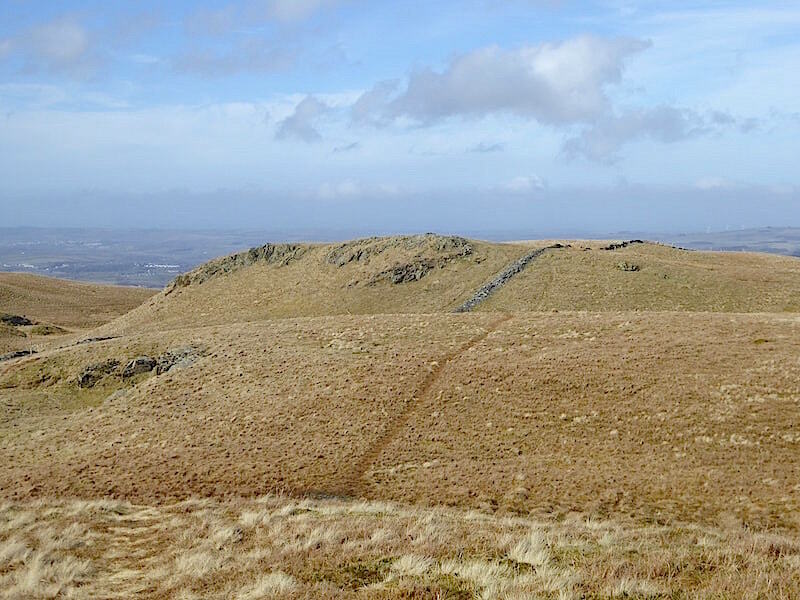 The summit group has departed and we’ve finished the coffee so we climb the last few feet up to the summit of Lord’s Seat with another look back as we do so. There’s a little bit of haze around as the air flow is southerly today but, after more than a week of well below zero temperatures, the haze is a small price to pay in exchange for some warm sunshine at last. 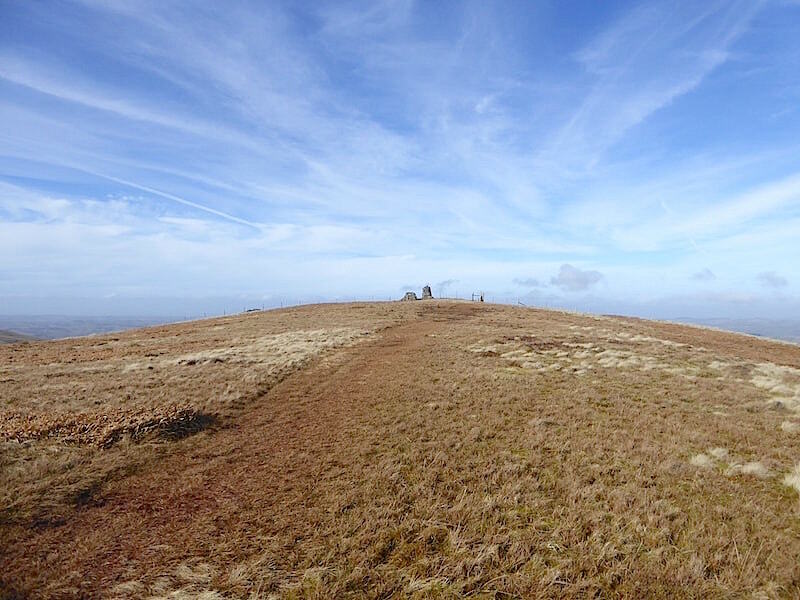 The summit of Lord’s Seat, ‘bare and open to the sky’ according to AW. 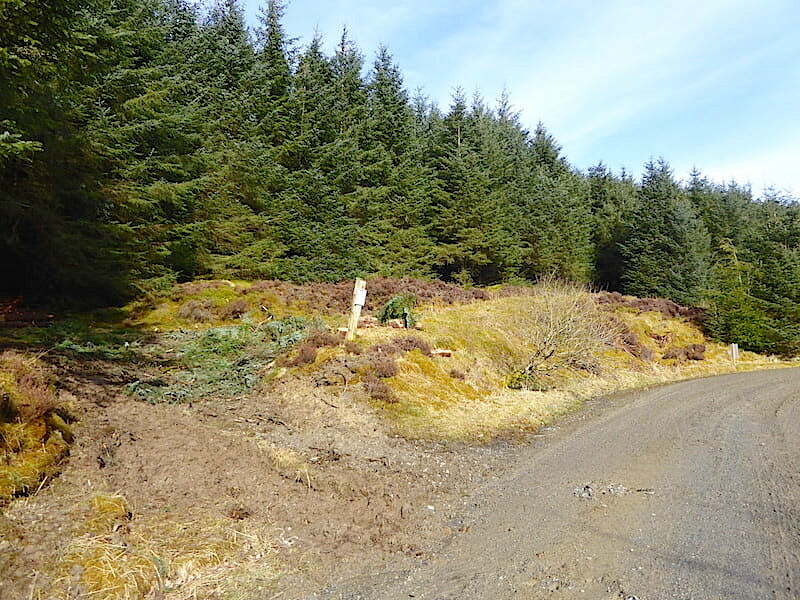 Somewhat underwhelming though, sporting only a solitary iron fence post and a scrape of stones to mark the high point. 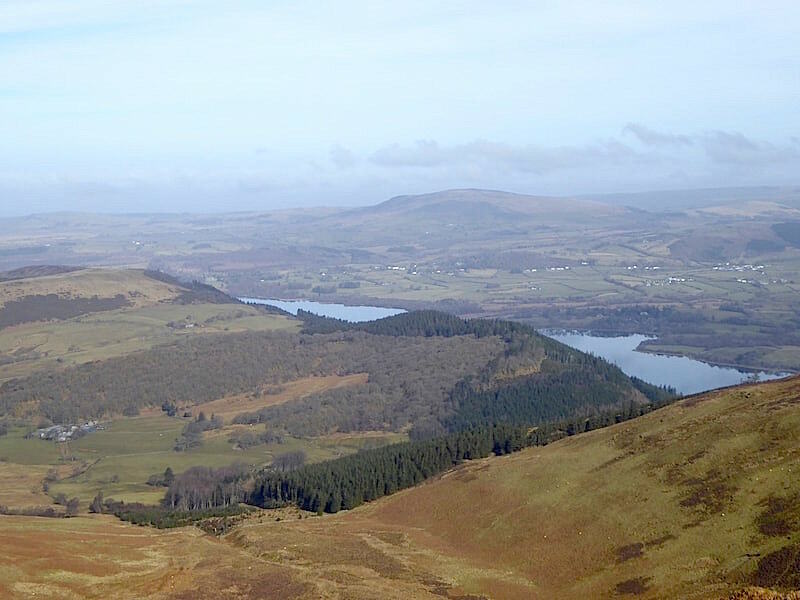 I walked a short distance away from the summit for a better view of Barf below us, with the Skiddaw group beyond it where the cloud is beginning to break up …..
….. and from the same spot and turning a little to the left for a glimpse of Bass Lake with Binsey in the distance. 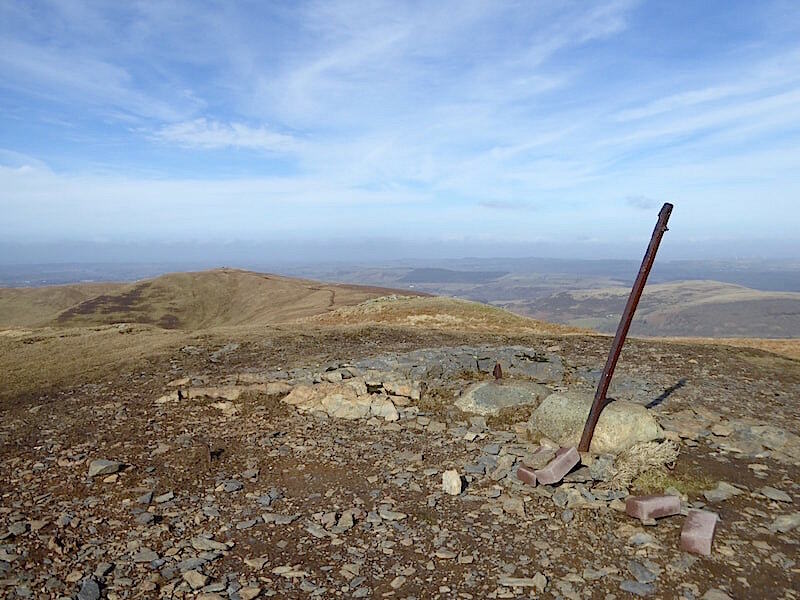 Back to the summit for a look ahead to our next objective, Broom Fell. 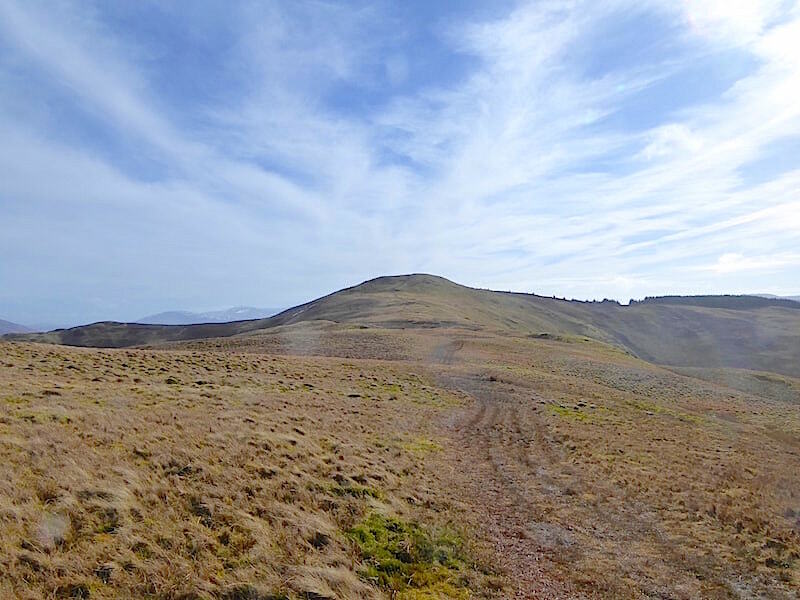 The distance between Lord’s Seat and Broom Fell is just under a mile and marshy in places but despite that its a very enjoyable tramp over the gently undulating ridge. It was all the more enjoyable today since there was very little breeze and we weren’t battling to stay upright as has been the case on all our previous visits. With those past experiences in mind though we had put our jackets back on again and of course we needn’t have bothered. 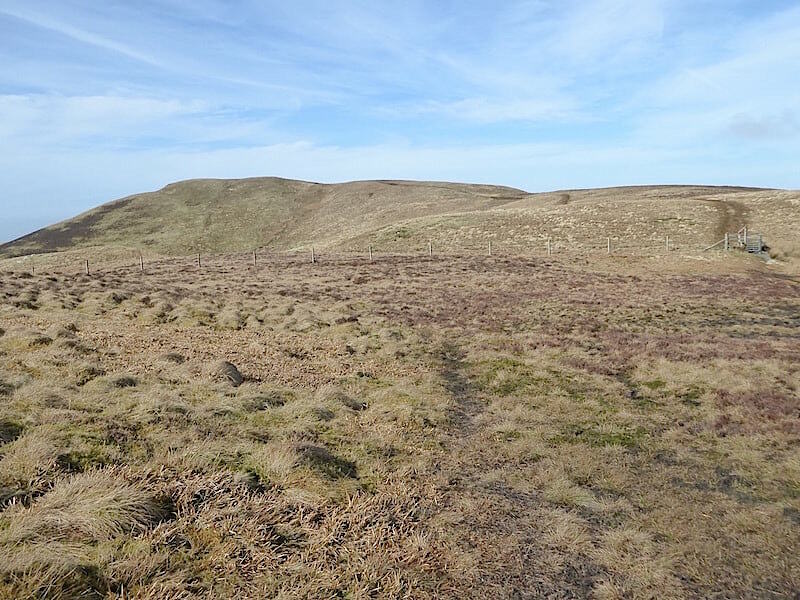 The lighter green area, on the left between here and Broom Fell, is Todd Fell, it isn’t marked on our route map but it is marked on the OS maps. 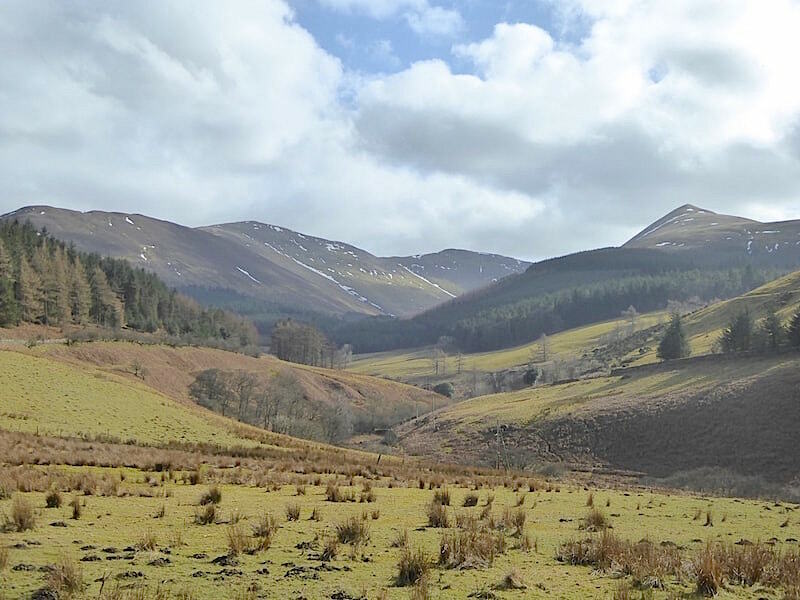 The Aiken Beck Valley flanked by Whinlatter Fell on the left and Greystones on the right, beyond the valley is Lorton Vale and its surrounding fells. 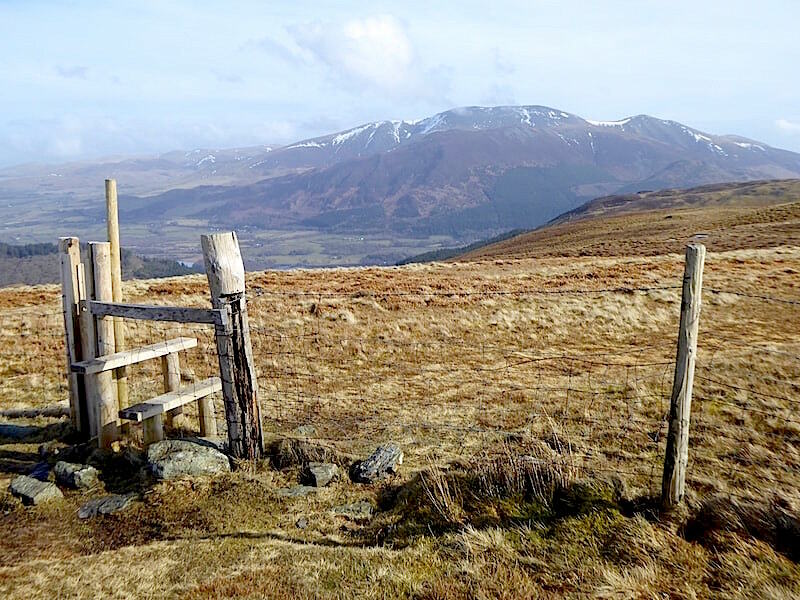 Heading for the gate and stile on the way to Broom Fell, with an expanse of squelchy marsh to cross before we reach them. 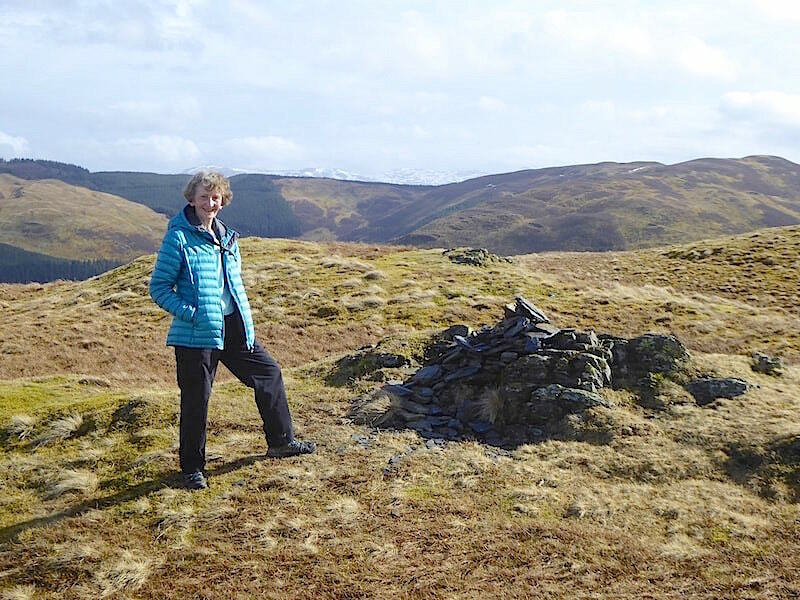 Before reaching this point we met the group of five walkers, who had been on Lord’s Seat when we took our coffee break, returning back there after their out and back visit to Broom Fell, every one of whom greeted us with big smiles and enthusiastic greetings. 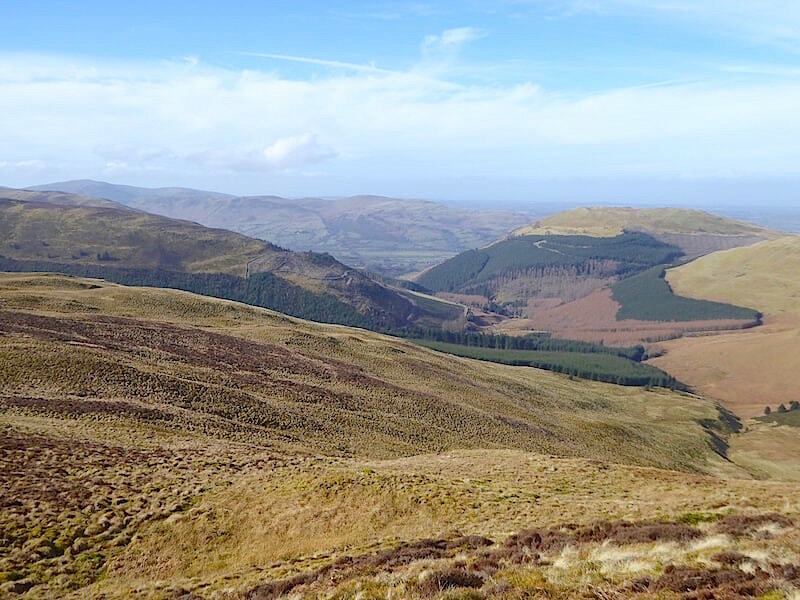 Looking down into the valley again as we cross over Todd Fell …..
….. and a look back to Lord’s Seat, to the left of which Clough Head and Great Dodd can be seen in the far distance. 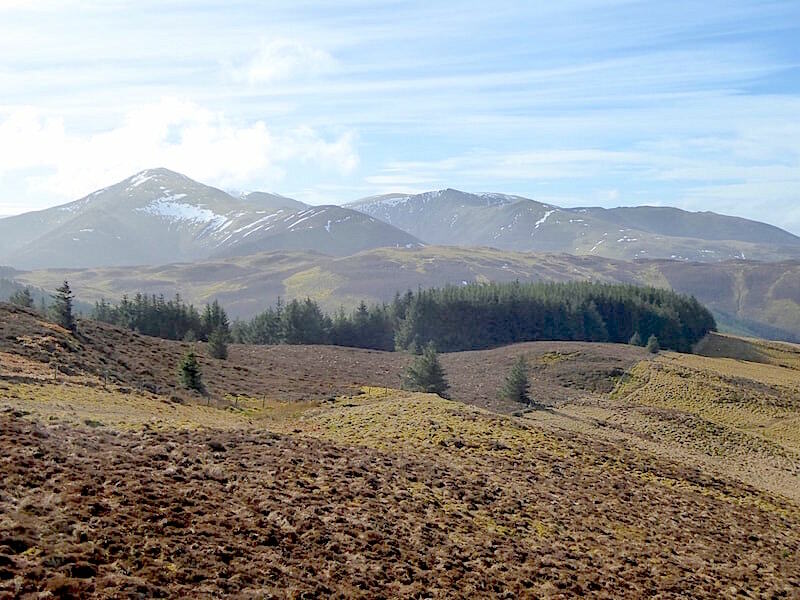 As we drove towards Keswick on the A66 this morning we could see that the Dodds and Helvellyn were still sporting decent amounts of snow despite yesterday’s rain. 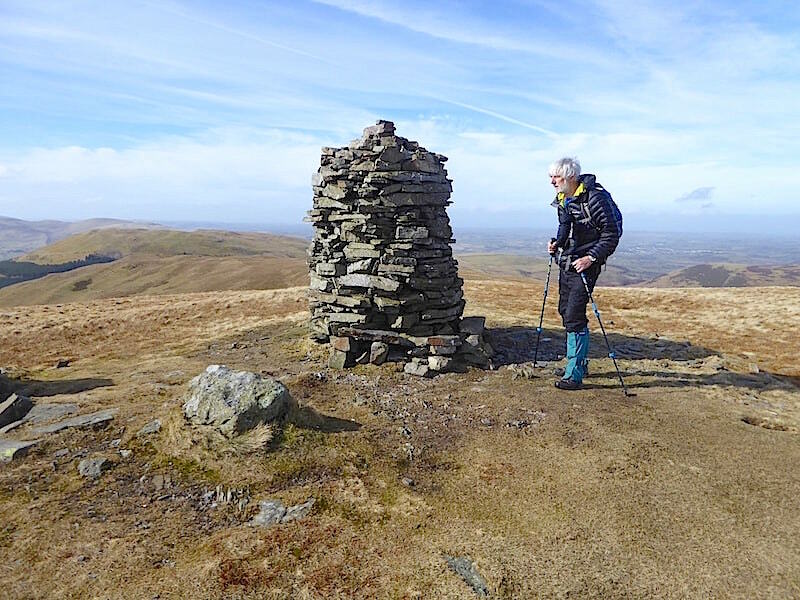 Approaching Broom Fell summit and its familiar …..
….. summit ‘furniture’, although the wind shelter on the right is less familiar as it has been rebuilt since our last visit in 2016. 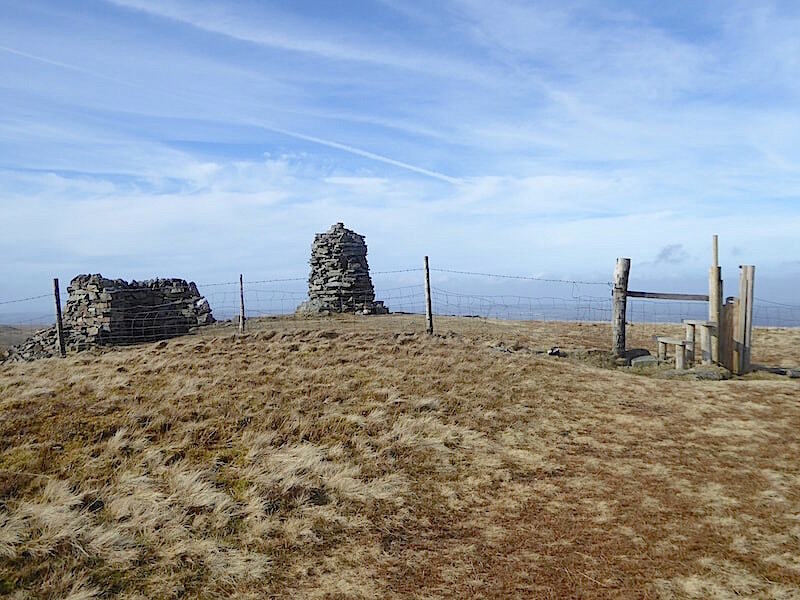 A quick hop over the stile and a summit shot beside the very tall pillar/cairn. 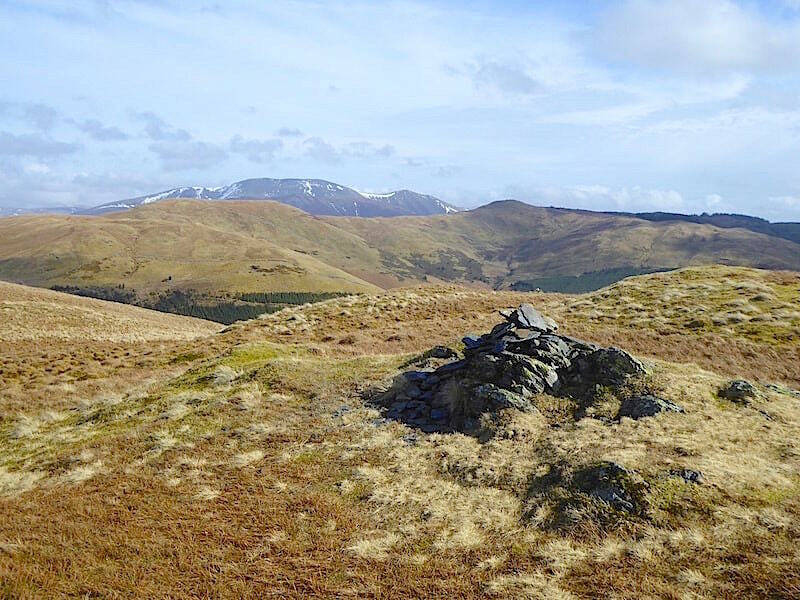 AW makes no mention of this pillar in his 1963 Pictorial Guide, mentioning only that the summit was featureless apart from the wall coming up from Aiken Beck. I can find no information as to who built it and when so I remain in ignorance. The wall AW mentioned ends here and in front of which the wind shelter has been rebuilt. 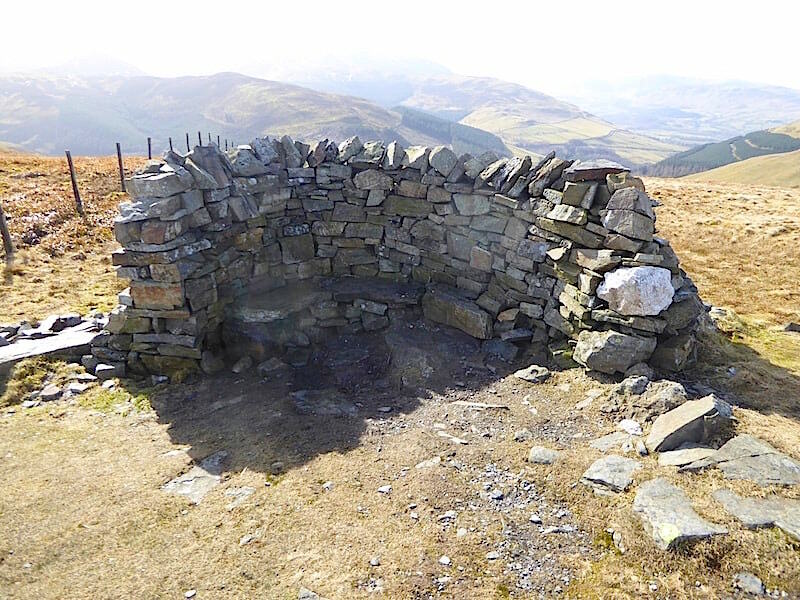 A sturdy construction, offering seating for three, or more if the size of their rear ends allows for it, and which hopefully will not succumb to the elements or vandalism for a good few years. 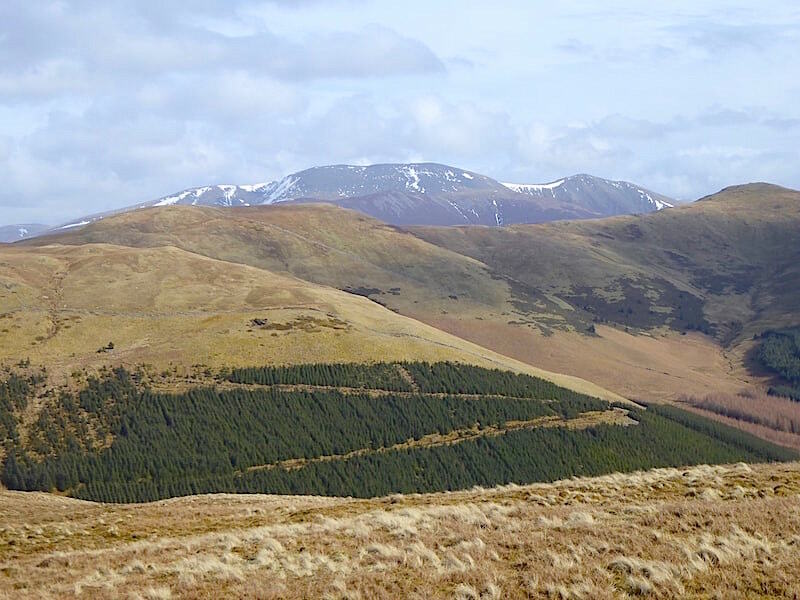 A look back to the Skiddaw group where the cloud has finally cleared. 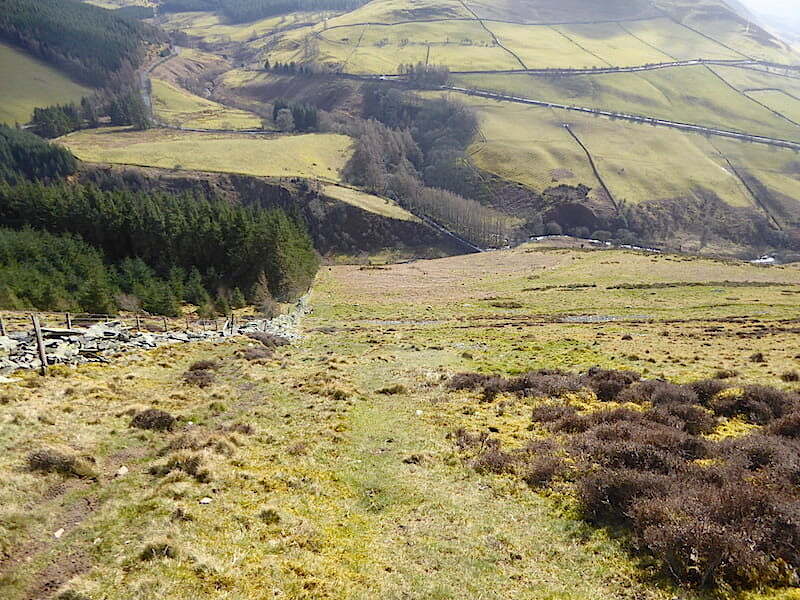 While we were here a runner came along from Lord’s Seat and we had a five minute or so chat with him, he’s the black and white speck on the path at extreme right of the shot, just below the crest of the rise. He was trying to plot a route back to his car which would avoid some logging activity which was taking place close to it, despite it being Sunday, and which would avoid simply going back over his outward route. Nothing we suggested seemed to be quite what he wanted and he eventually decided to go over to Greystones and work out a return route once he got there. 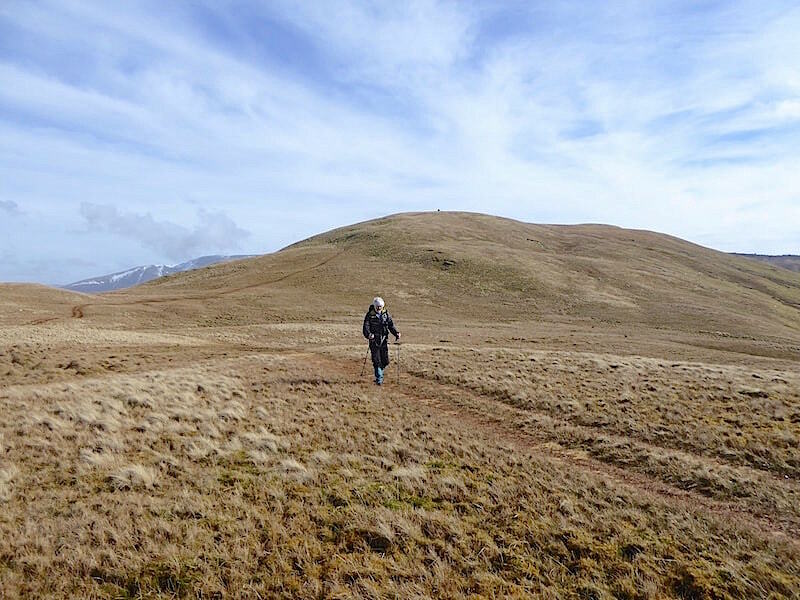 We carry on across to Widow Hause at a more leisurely pace than his and on the way I took a look back towards Broom Fell and the snowy tops of the Helvellyn group. We left the jackets on because we simply couldn’t be bothered with the faff of stopping and packing them away again. 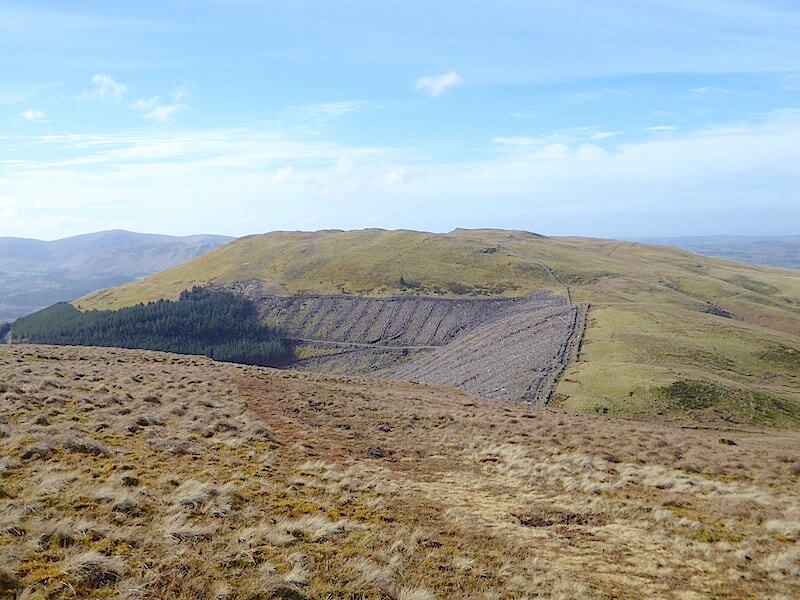 Graystones beyond the cleared plantation at Widow Hause …..
….. and a look over to our left for a view of the fells on the skyline beyond Lorton Vale, namely, from left to right, Gavel Fell, Blake Fell and Burnbank Fell. 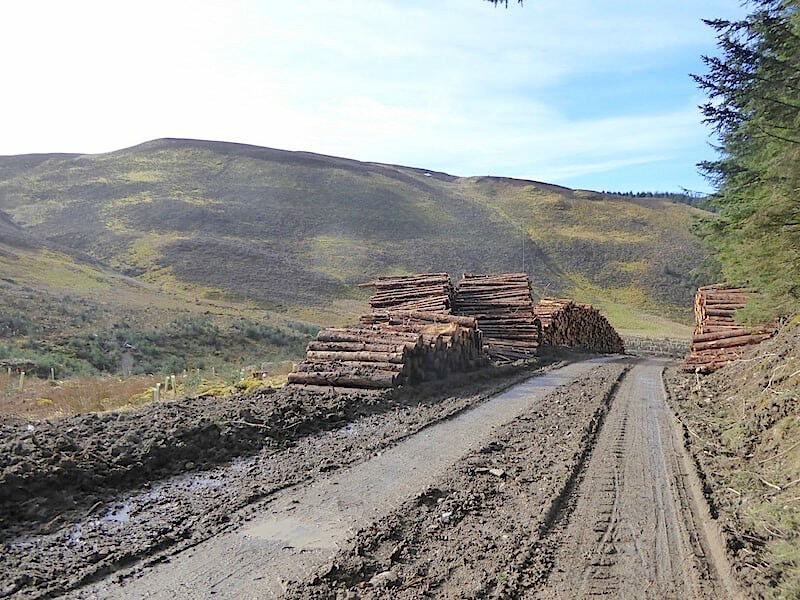 Dropping down to Widow Hause where a heck of a lot of tree felling in the Darling How plantation has taken place over the past few years. 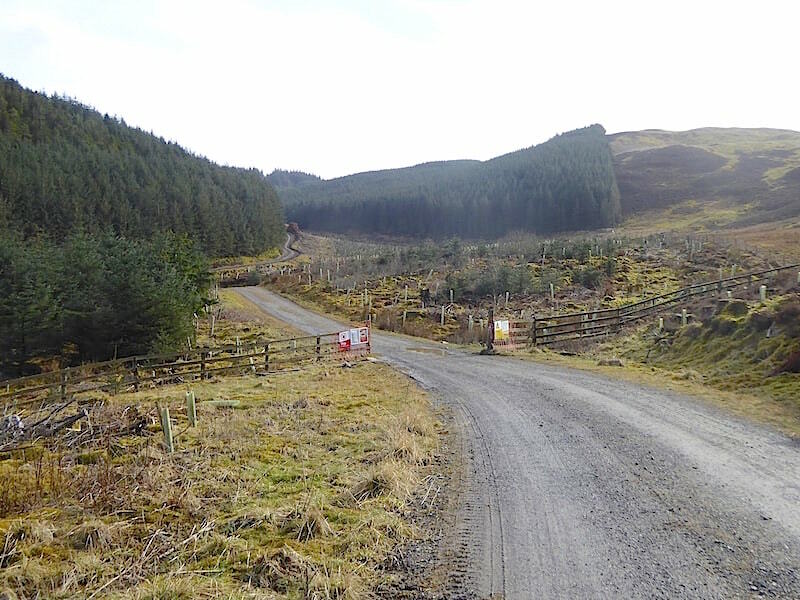 A view back along our route as we reach Widow Hause …..
….. and then continue across above the bare plantation to the crossing point by the little kink in the wall. 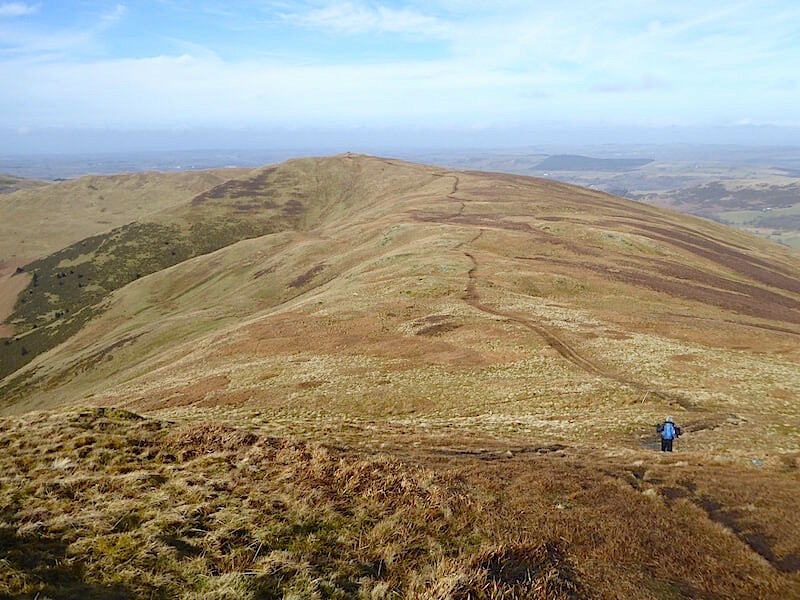 From there we’ll follow the traverse path running across the fellside up to the summit of Graystones. Before we start on the traverse path though I just had to stop and remove my jacket and mid-layer jumper. Its just gone 12.30 and the day has warmed up considerably, and although the forecast was for a fine day we didn’t expect it to be this warm so early in March. 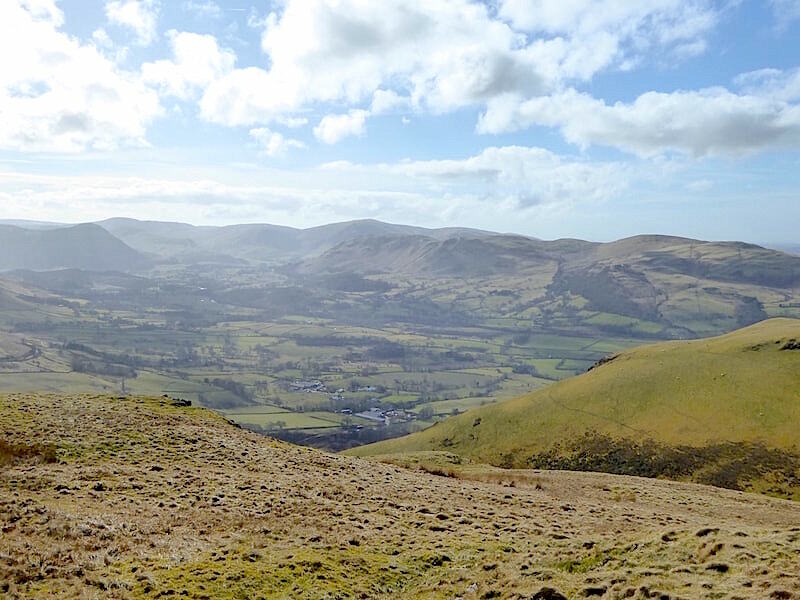 A look back across Widow Hause to Broom Fell and Lord’s Seat as we begin to climb the traverse path …..
….. and on to the summit of Graystones where Skiddaw dominates the skyline with Broom Fell and Lord’s Seat cowering submissively below it. Looking westward across the outcrops from Graystones summit …..
….. where a slight breeze sprang from nowhere and had me reaching for my jacket again to avoid losing my warmth. We found a sunny little hollow off to the left and settled down for a spot of lunch. In the distance you can see the amount of snow still lying across the Dodds and the Helvellyn group, its been pretty chilly over in the east, I can tell you. 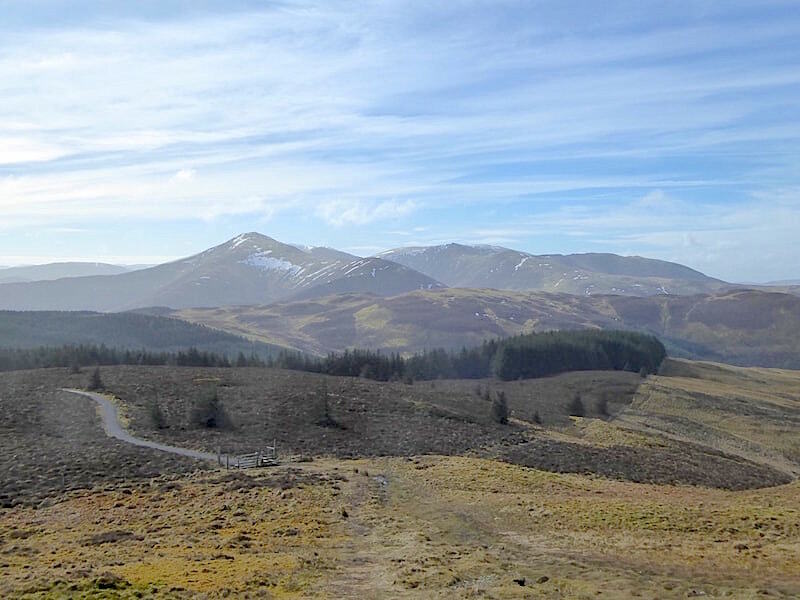 We gather our stuff together and make our way over to the descent path with one last look over to Broom Fell, Lord’s Seat and the Skiddaw group. Still very hazy across Lorton Vale. What goes up, must come down, so off we go down the very, very steep descent path from Graystones. Our jackets came off again on the way down so we could stop feeling like boiled puddings. 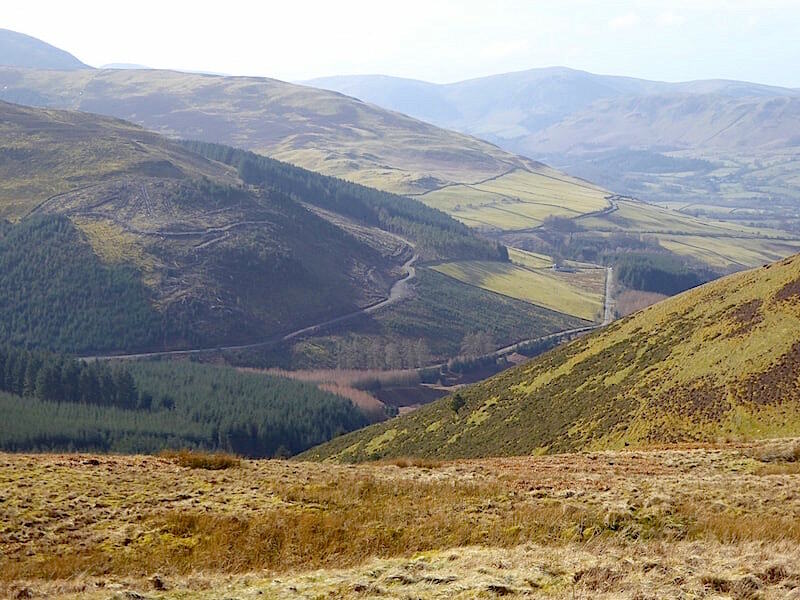 The little black speck way below us, on the path alongside the trees, turned out to be a pair of walkers just beginning their toil up to the summit. We really didn’t envy them their choice of route especially with the warm sun blazing down on them. Its hard enough going down, going up is just torture and, according to AW, ‘lacks excitement and is hardly worth the effort’. These two together with the group of five walkers and the lone runner are the only people we’ve met or seen today but then it is Mother’s Day so perhaps everyone was busy visiting their mums and treating them to Sunday lunch. 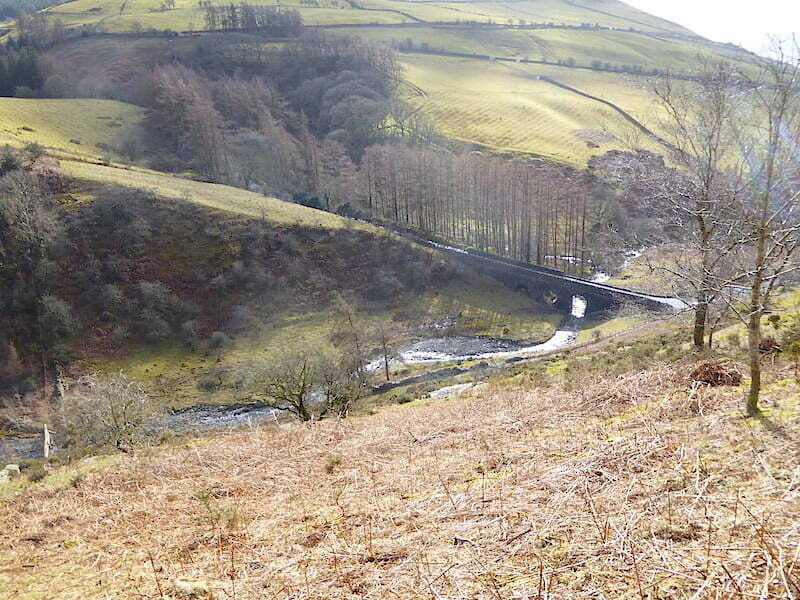 Not much further to go before we reach the stretch of level walking alongside Aiken Beck and on to the parking area at Scawgill Bridge. 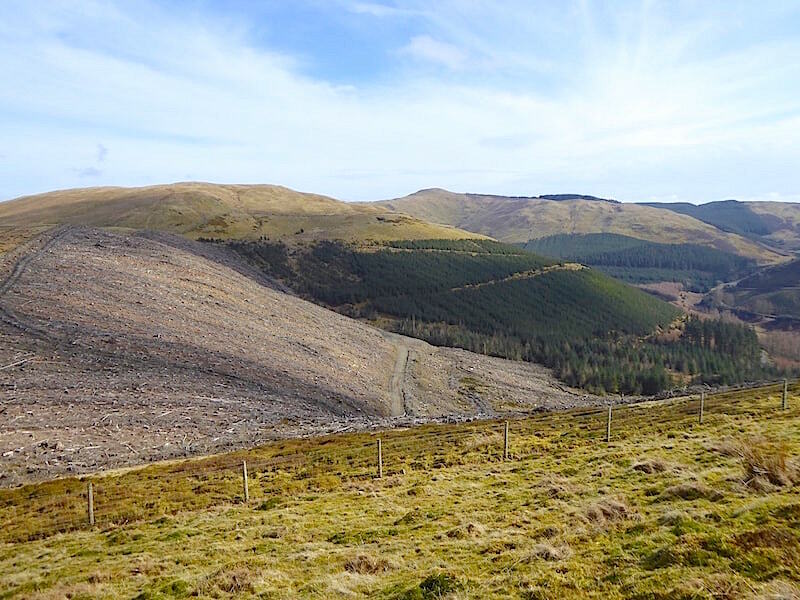 As we were descending alongside the tree plantation further back up the path we had hummed and hah’d about crossing the stile in the fence and taking the forest path to Spout Force, then crossing Aiken Beck and returning to the car by that route. In the end we decided not to bother and opted to return to the car via the short stretch of road from the bridge instead. 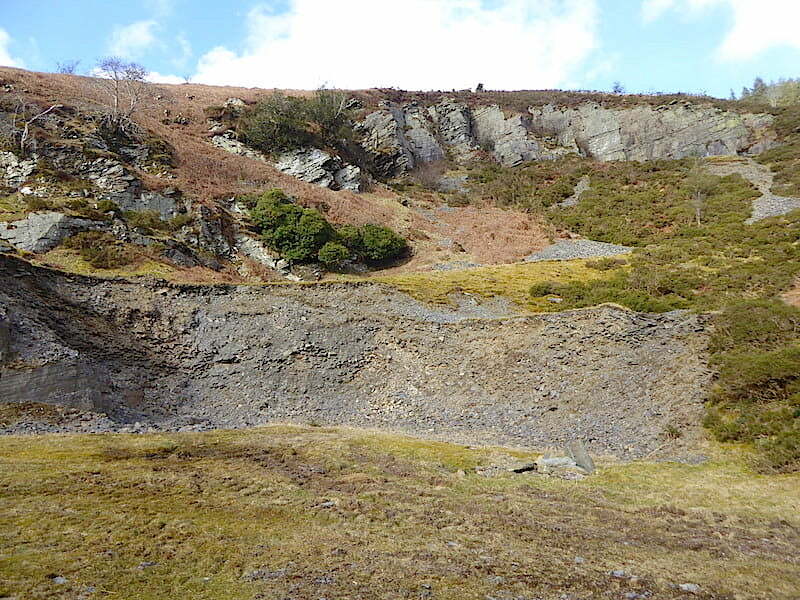 I finally remembered to take a shot of the disused quarry just above the bridge before we went out onto the road. Its one of those things that you always mean to do when you’re halfway down the path and then promptly forget about when you finally get there. 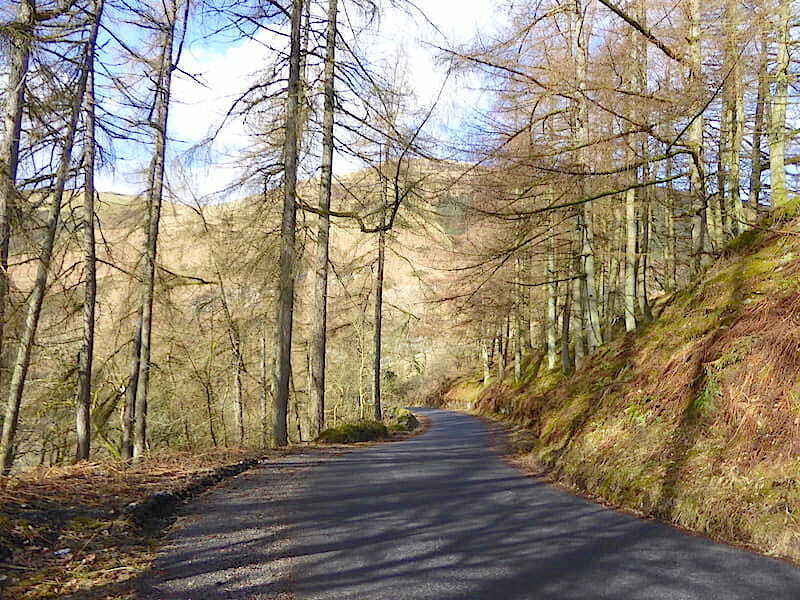 A look back along the road as we climb up from Scawgill Bridge in the lovely early afternoon sunshine. 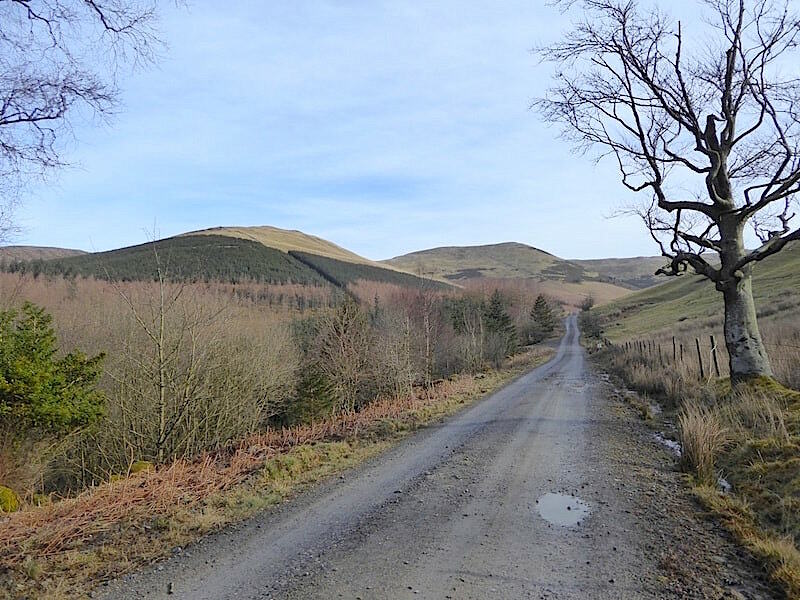 From the road we look across to Graystones and Kirk Fell, its outlier, to the left of it. The couple we met on their way up had just crossed over the top of the first rise, that must have been one very hot and sweaty ascent today. 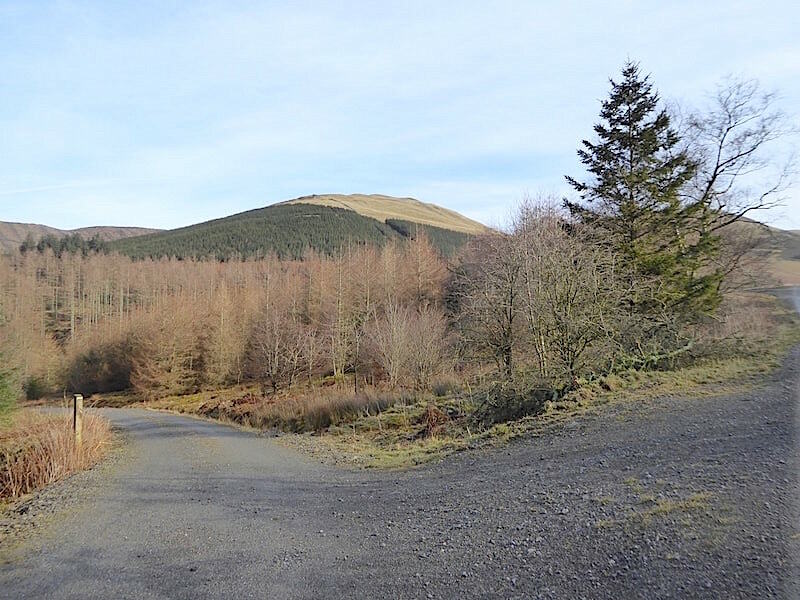 On the other side of the road we have a view along Hobcarton Gill. 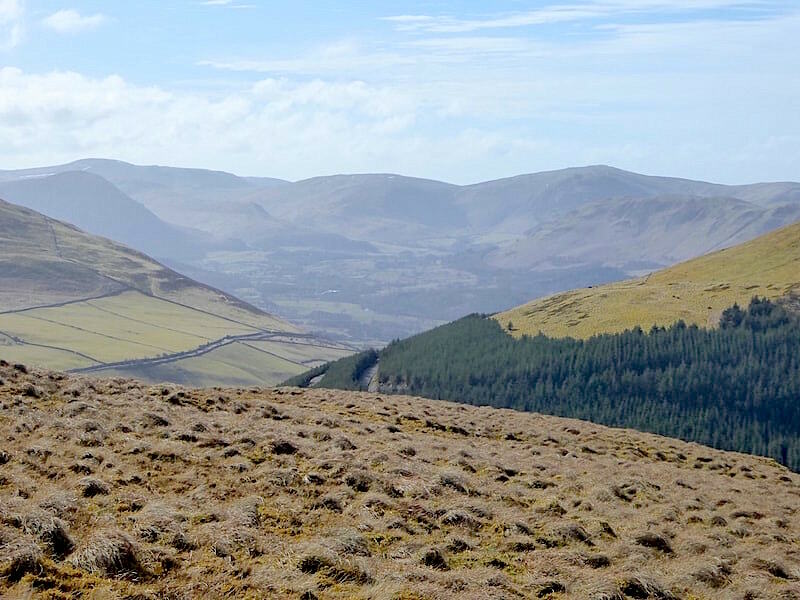 To the right is Ladyside Pike, in the centre is Hobcarton Crag, and over on the left are Grisedale Pike and Hobcarton End. Its a grand view and must have looked spectacular when the snow was down. We come full circle and arrive back at the parking area opposite Darling How Farm, and have you noticed that I haven’t once mentioned having numb and frozen hands? I didn’t need my gloves today and I can’t remember the last time that happened it was so long ago. The car belonging to the walker who was waiting for a walking group to arrive is still parked where it was when he arrived this morning. There isn’t a greater number of cars parked than there was this morning but at least one of them is a different one so maybe someone turned up after all, I hope so anyway. 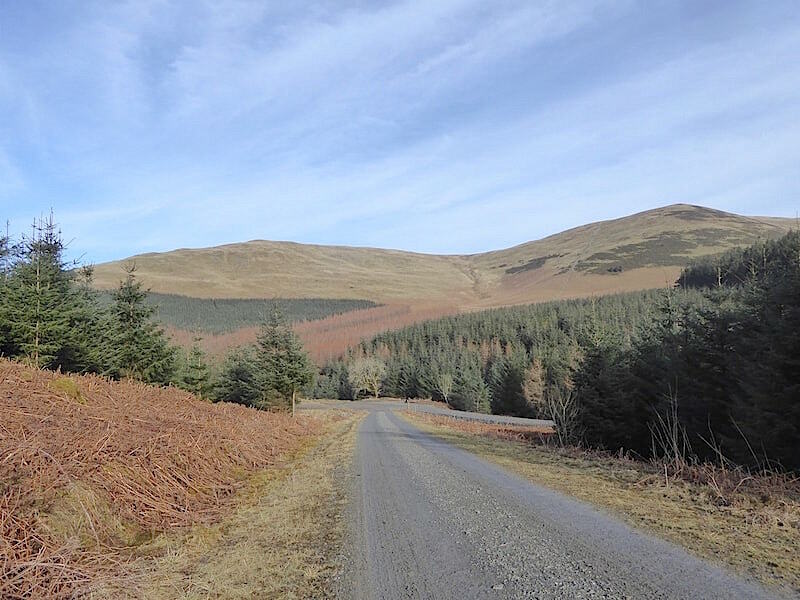 There’s no sign of anyone around but then it is only just after 2.00 pm so the car owners will still be out on the fells. 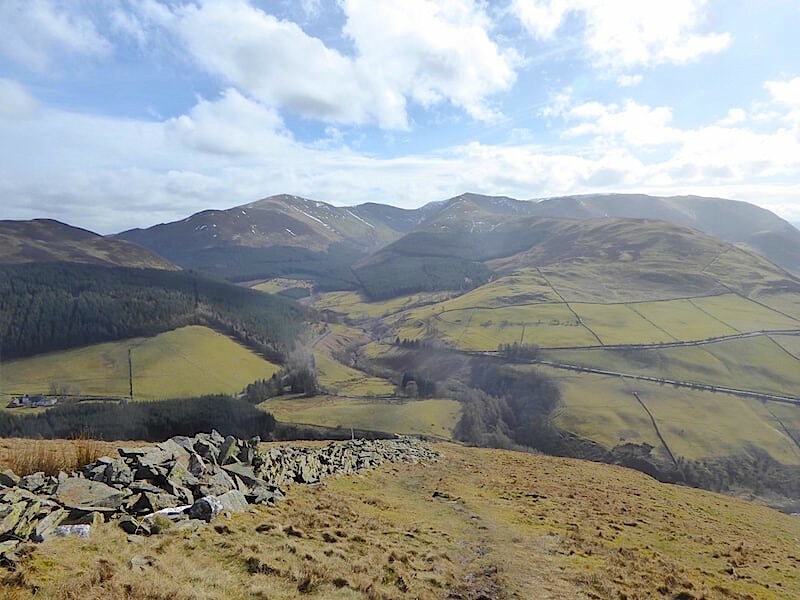 We could have included Whinlatter Fell which would have extended our walk and we could have been enjoying the lovely weather for a little while longer, but we just didn’t think about it. Hindsight’s a wonderful thing but foresight is much better.